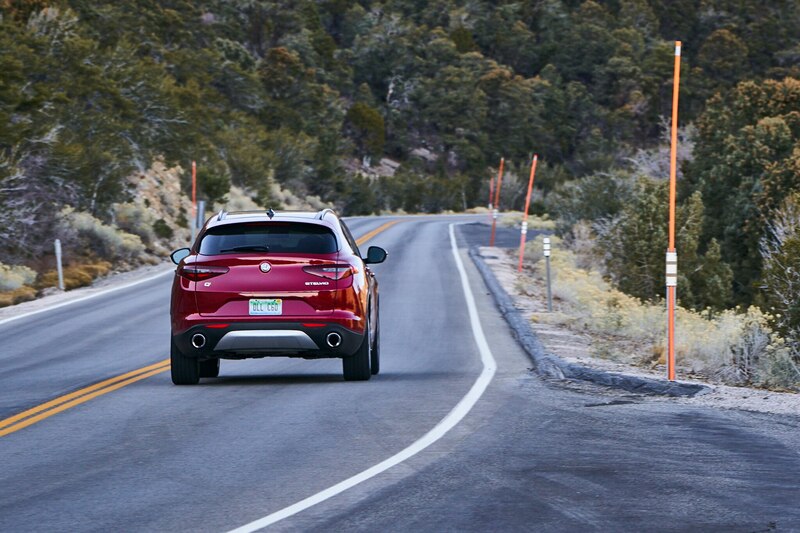 Last December, during our annual All-Stars competition, I got my first chance to sample the 2018 Alfa Romeo Stelvio on our designated road loop twisting up and down Nevada’s Mount Charleston. 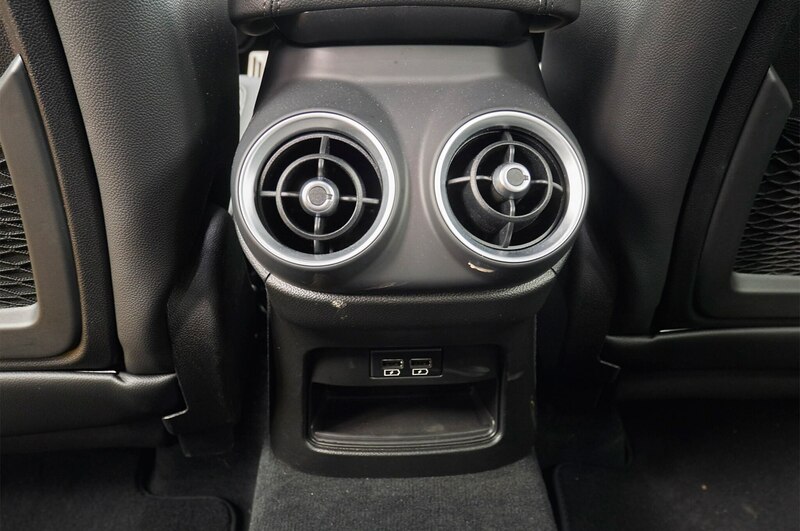 And I did grin. 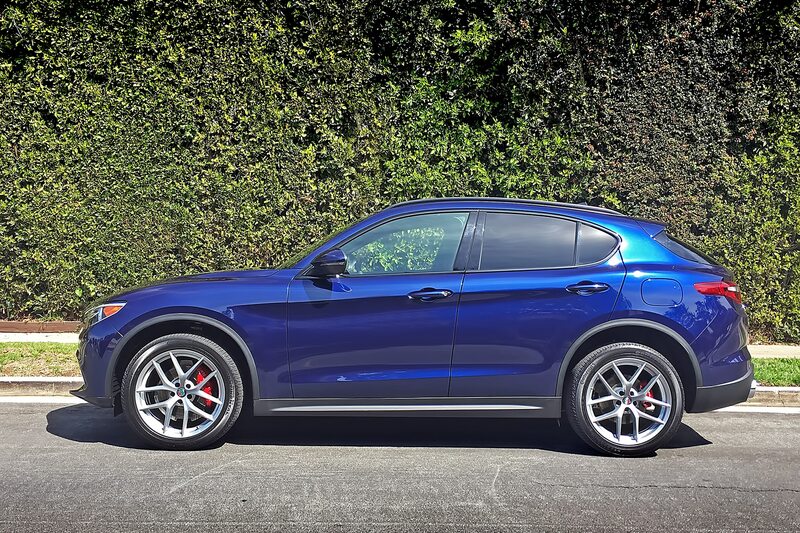 Never did I expect a little 2.0-liter four—even a turbocharged one—to run with such effortless pace. 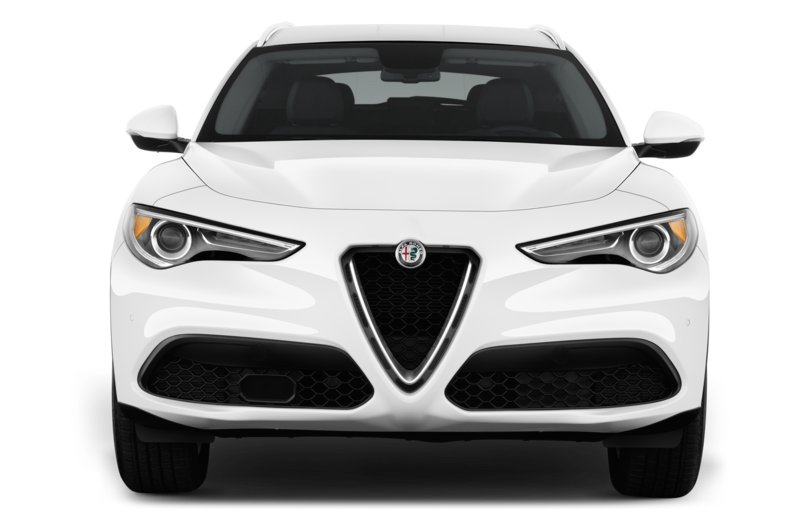 A chassis tuned by the same folks who wrought the marvelous Giulia sedan’s just made the drive that much sweeter. 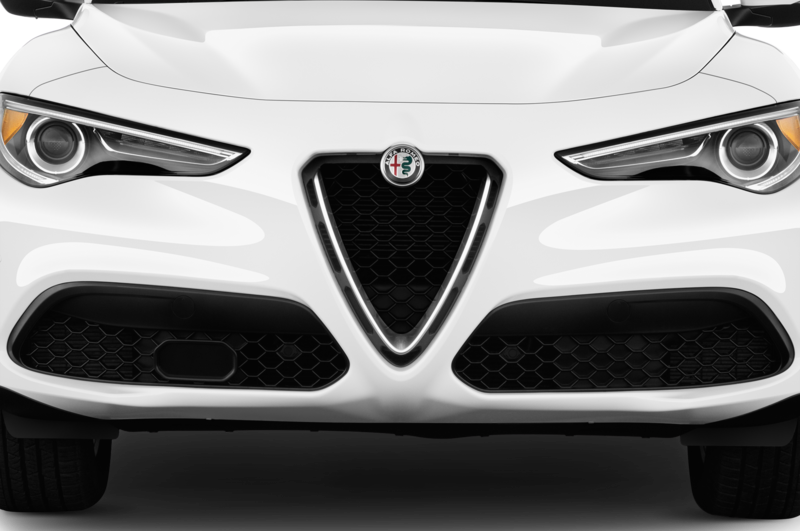 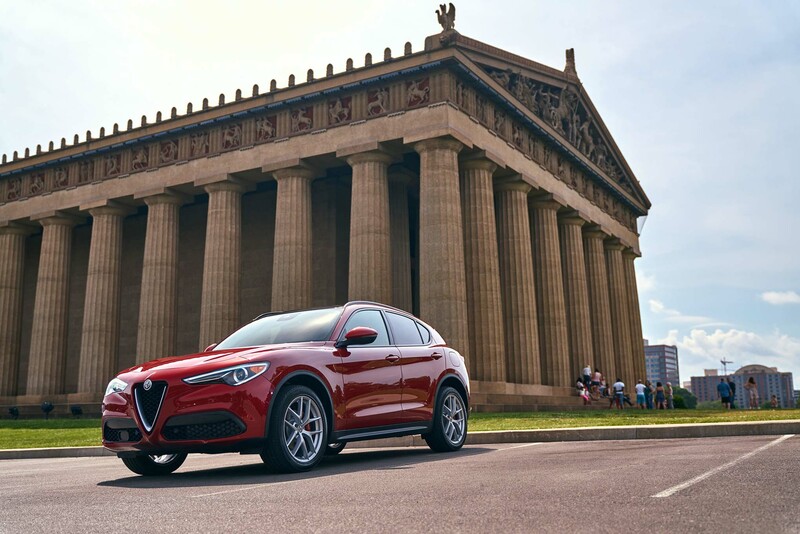 That first drive left no doubt: Alfa Romeo’s first-ever SUV, like the Milanese snake on its hood ornament, has got some bite. 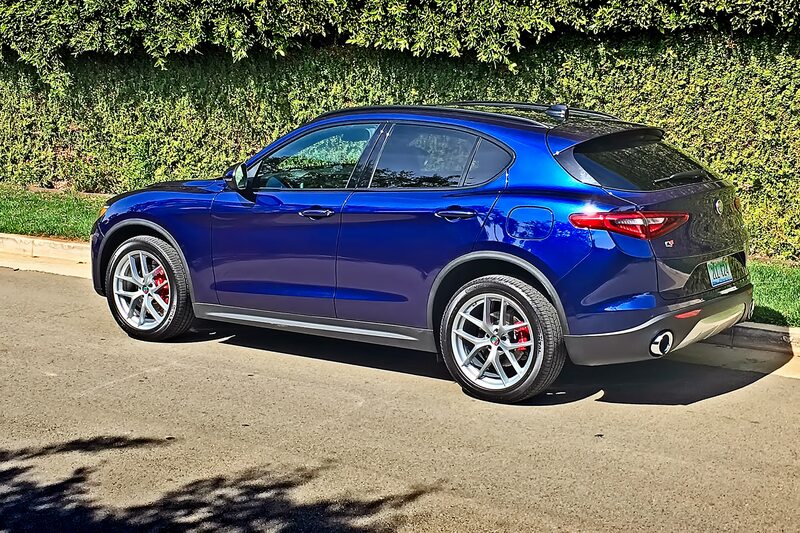 As for what it’s like to live with a Stelvio as a daily driver, I got an opportunity to find out recently back in my hometown of Los Angeles. 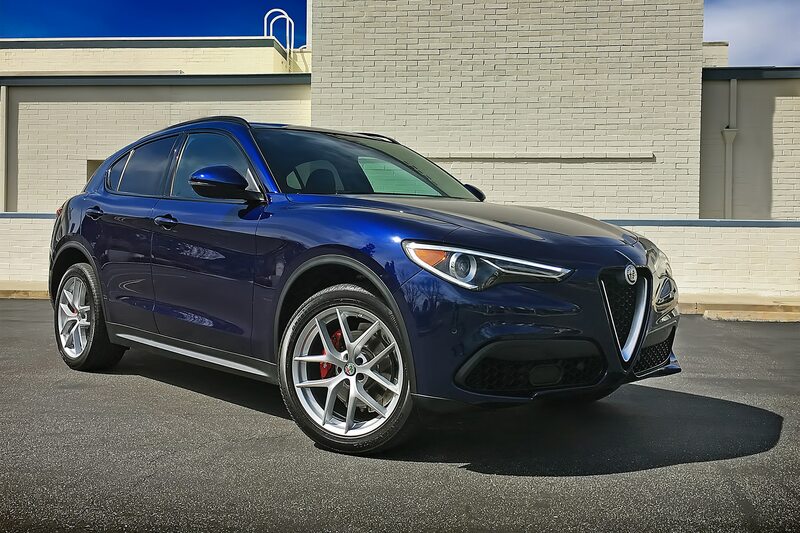 The test vehicle: a mid-level version with the Ti Sport AWD package—which, for $4,500 over the price of the base model, adds such niceties as leather sport seats with adjustable side bolsters, 20-inch aluminum wheels, aluminum interior accents and pedals, a leather-wrapped sport steering wheel, a sport-tuned suspension, and more. 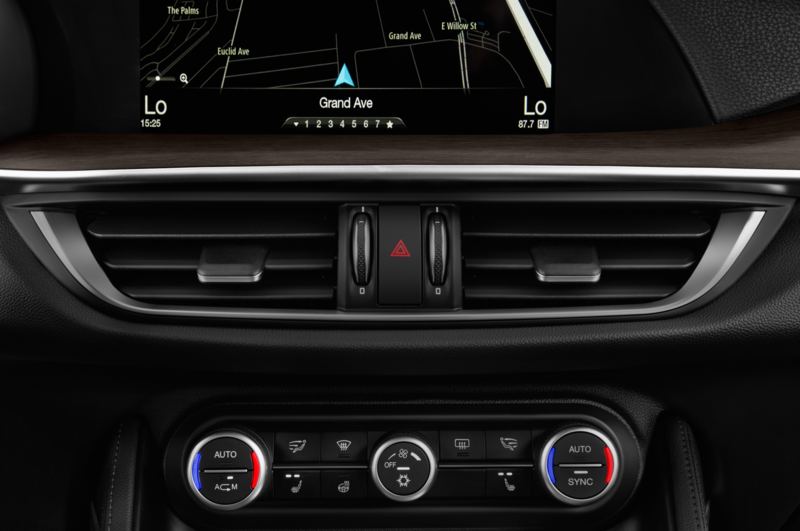 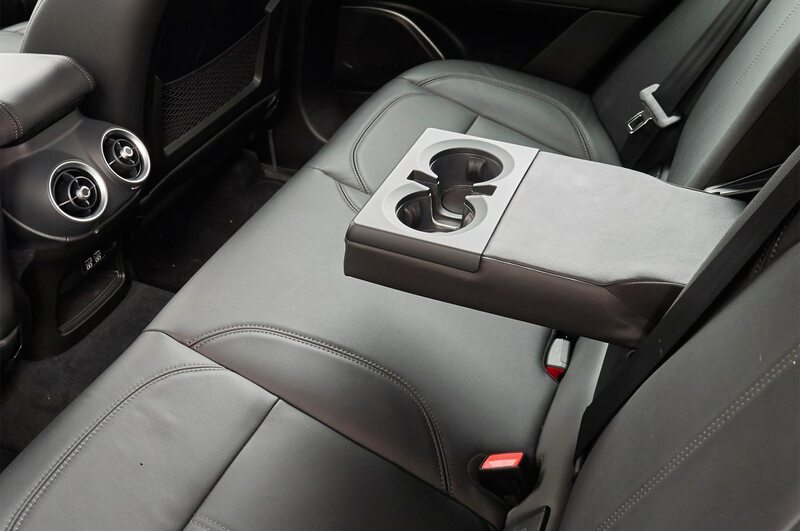 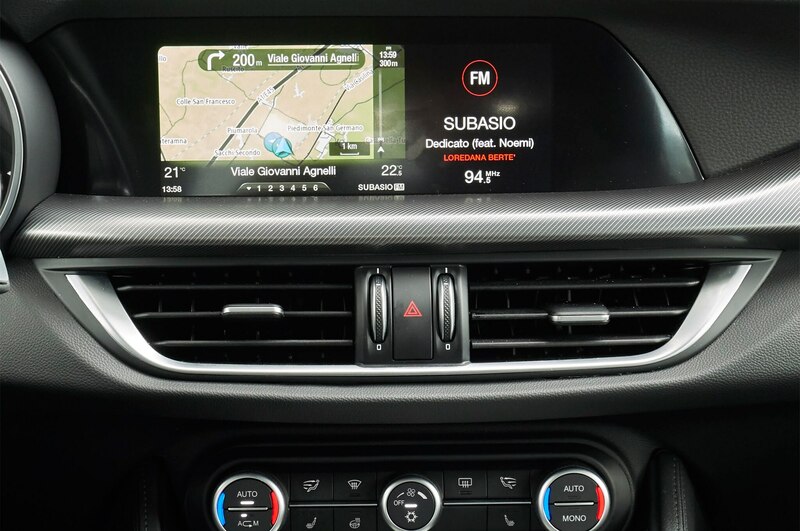 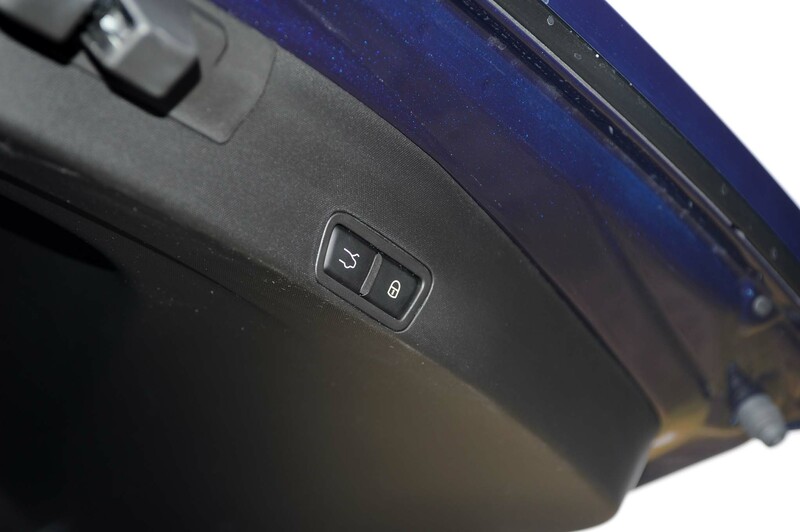 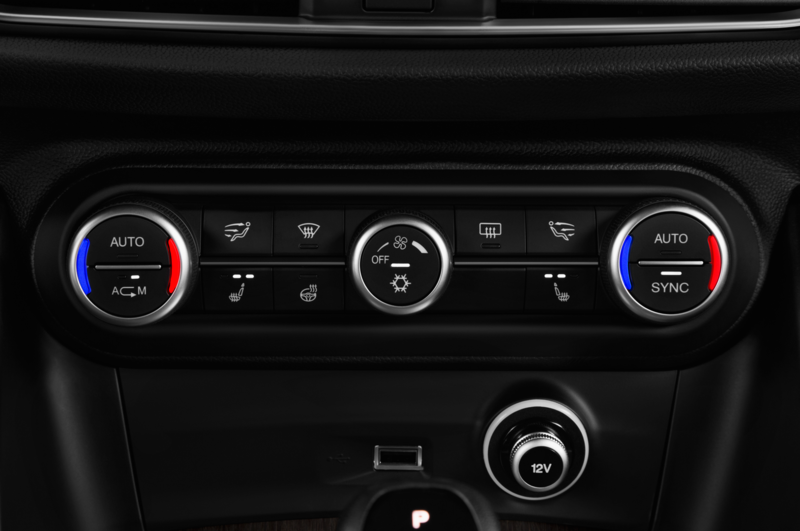 My tester also included such options as Montecarlo Blue metallic paint ($600), two driver-assistance packages (totaling $2,150) loaded with active safety features, an 8.8-inch color displace screen with 3D nav ($950), and a Harmon Kardon audio system ($900). 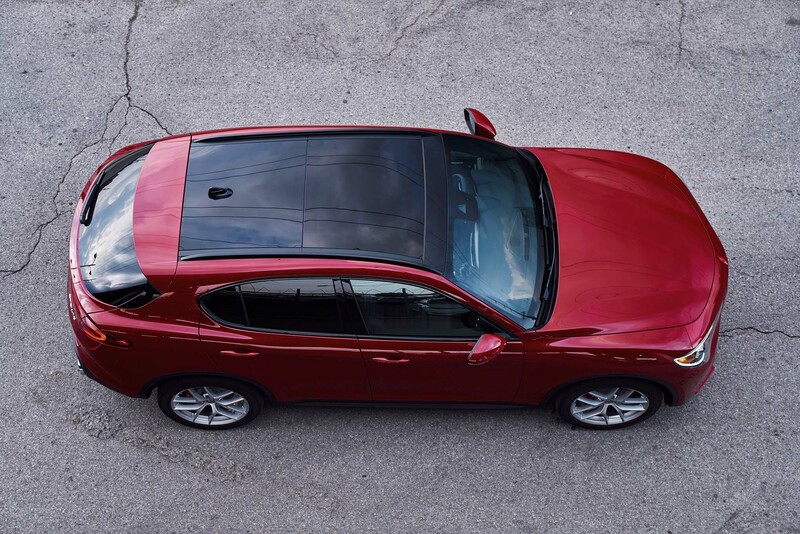 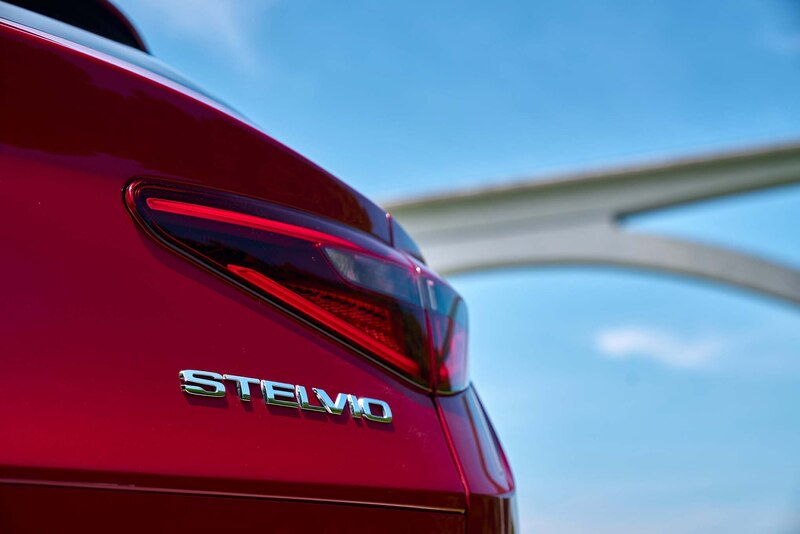 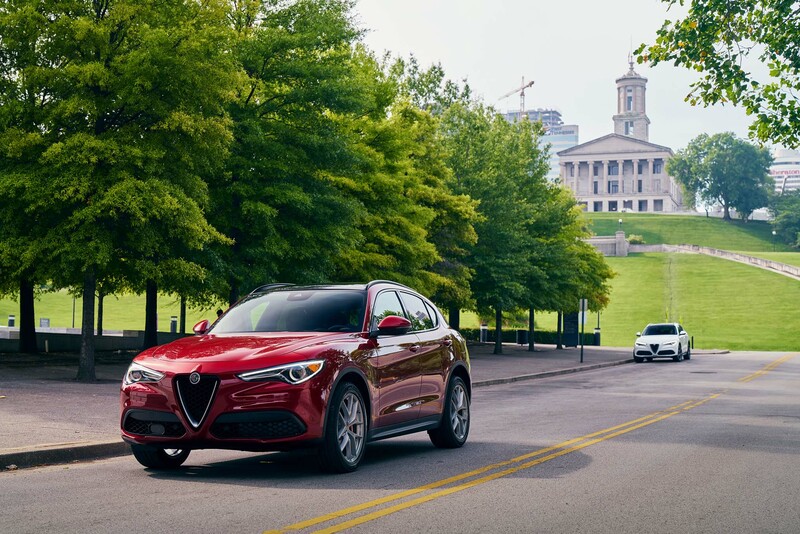 As welcome as these extras were, it’s worth noting that even the “stripper” Stelvio comes standard with all-wheel drive, leather seats, a backup camera with rear parking sensors, and keyless entry and start. 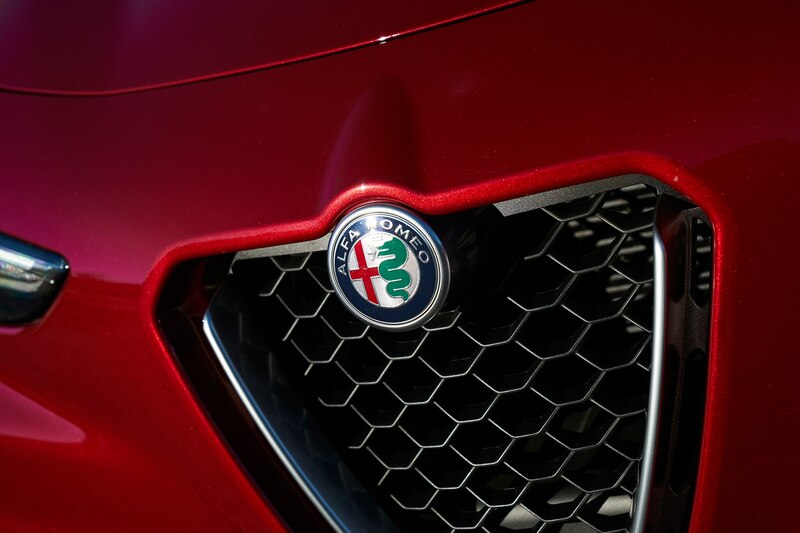 This Alfa treats its occupants well. 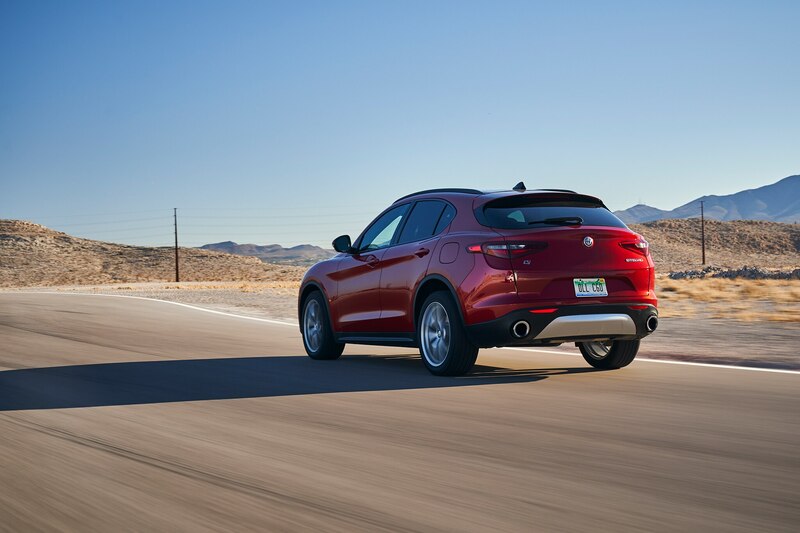 In the “sport/ute” balance the emphasis here is clearly on sport. 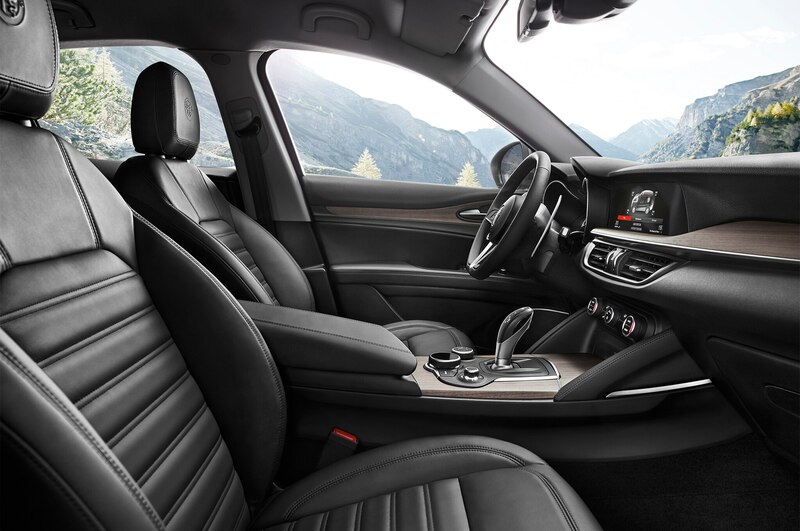 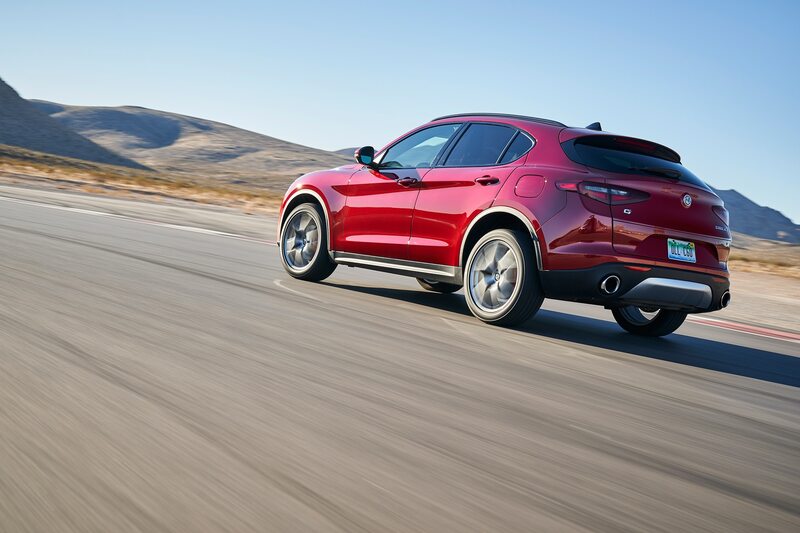 The Stelvio is a trim machine, a tad smaller a BMW X3, and while it’s capable of ferrying five adults, rear-seat legroom is marginal; you’d want to limit any such drives to short distances only. 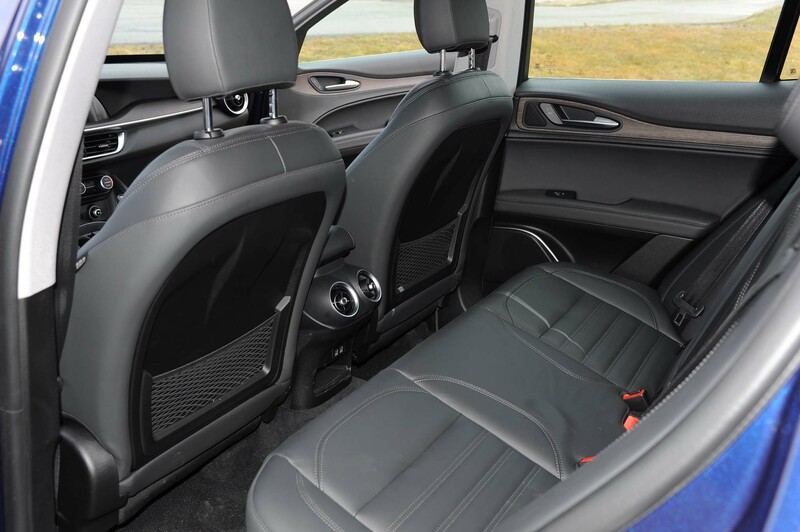 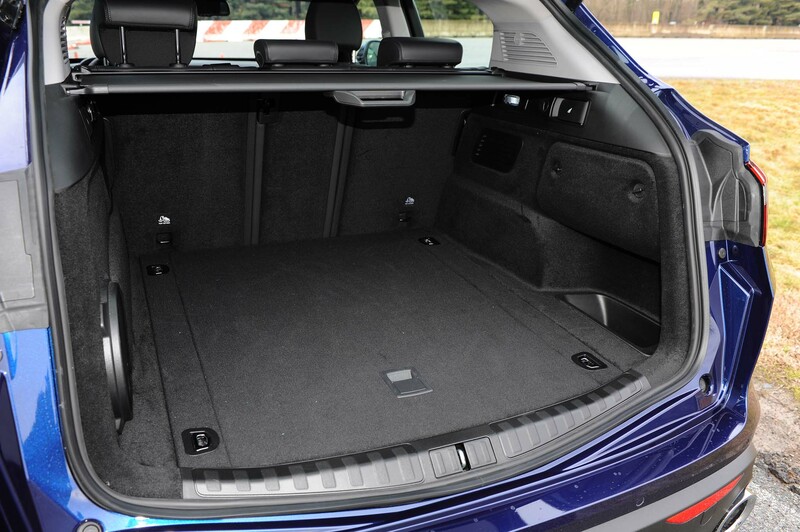 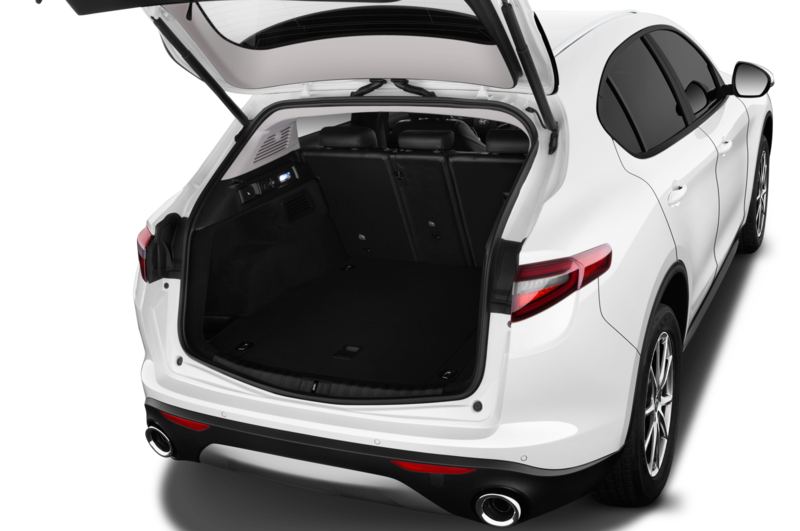 Similarly, cargo volume—at just 19 cubic feet with the second row seats up—is fine for a large load of groceries but probably not enough if you’re planning to take the entire tribe on a long drive with industrial-strength luggage. 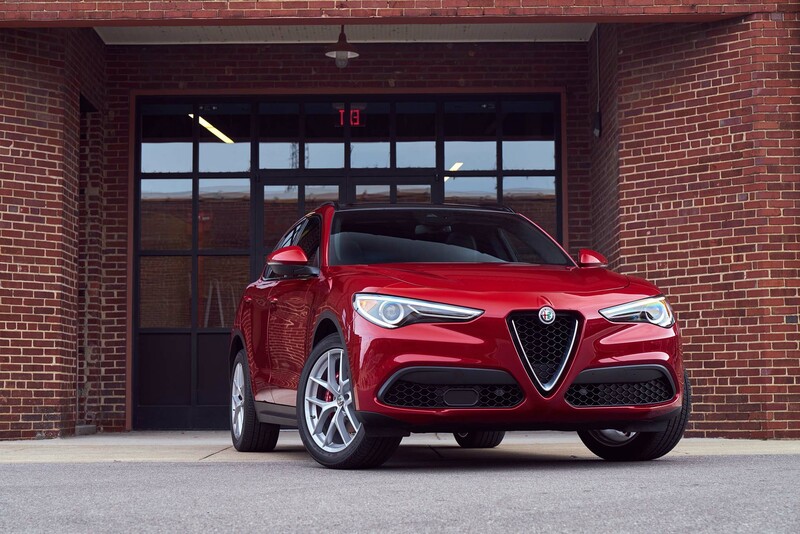 For the lucky two up front, however, the Stelvio is splendid. 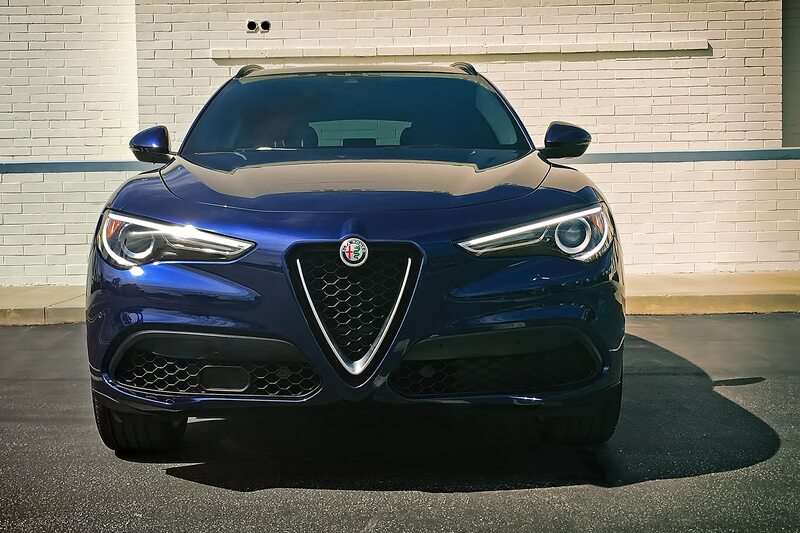 The cockpit of the Stelvio is clean and spare—almost too much so. 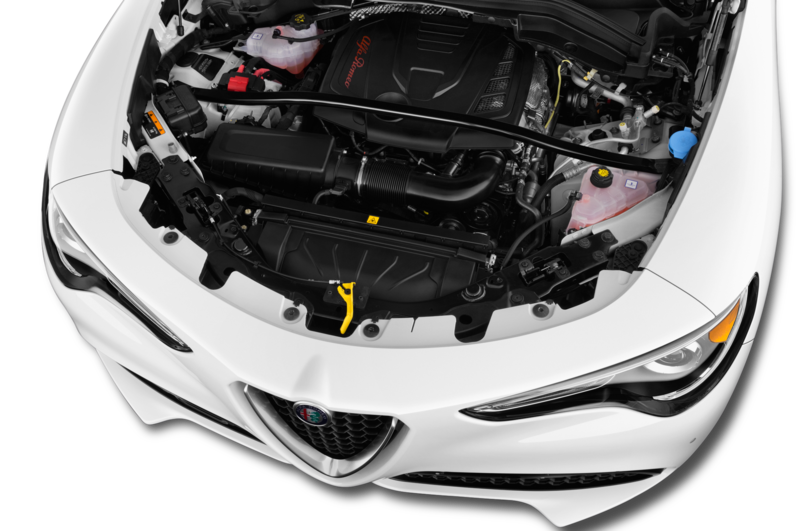 As in the Giulia sedan, Alfa Romeo clearly put the money into the powertrain and chassis, not interior pizzazz. 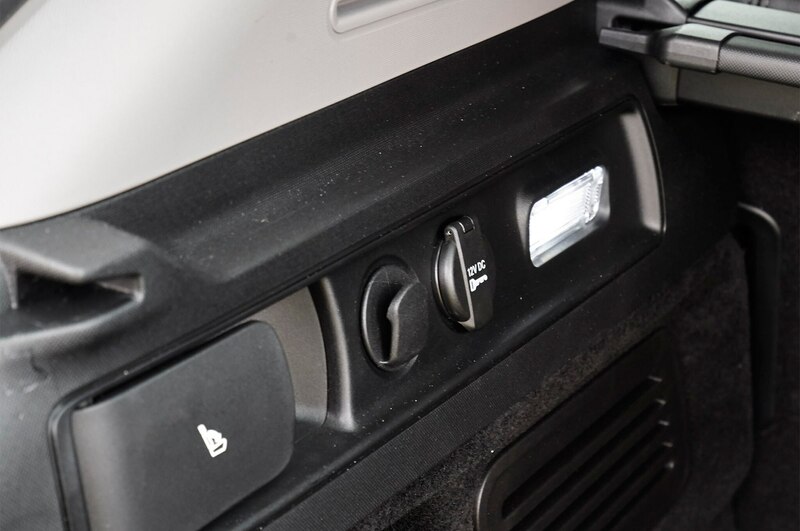 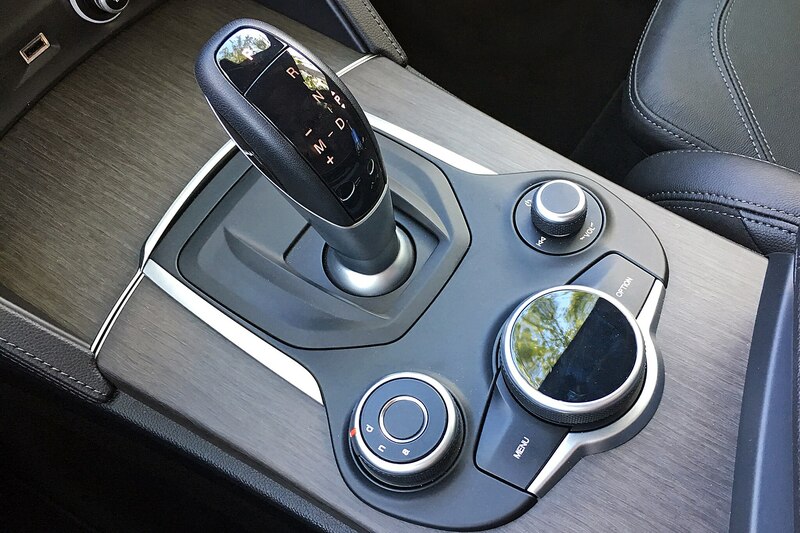 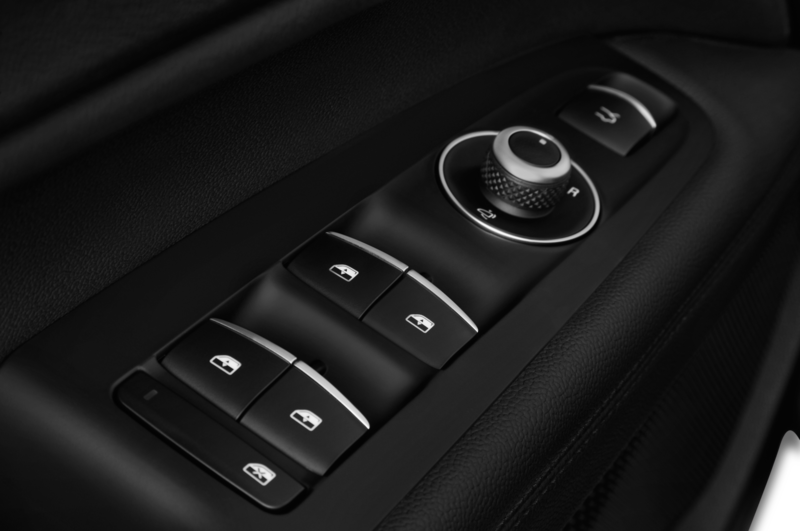 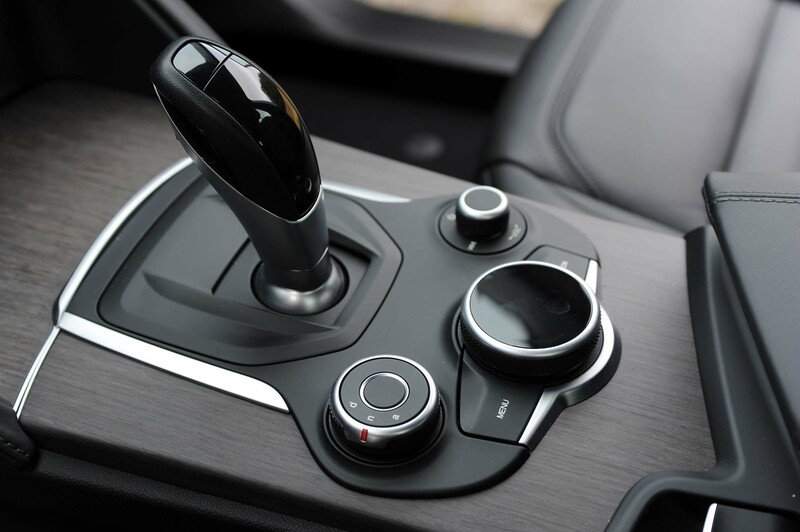 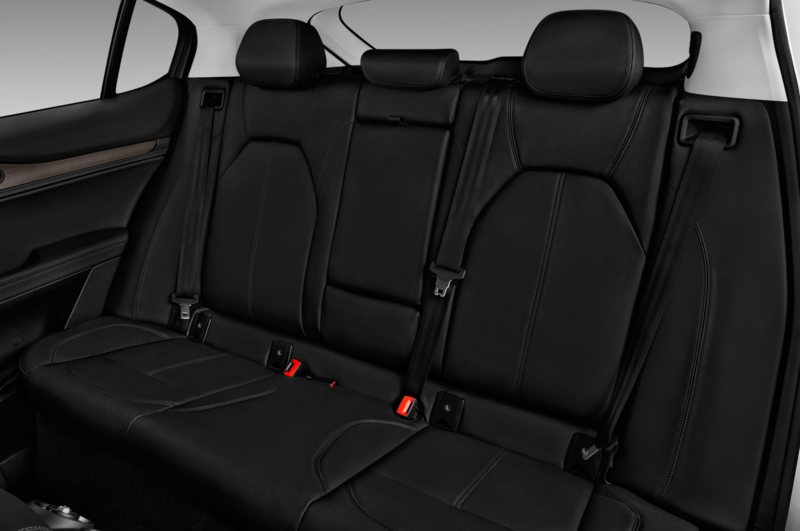 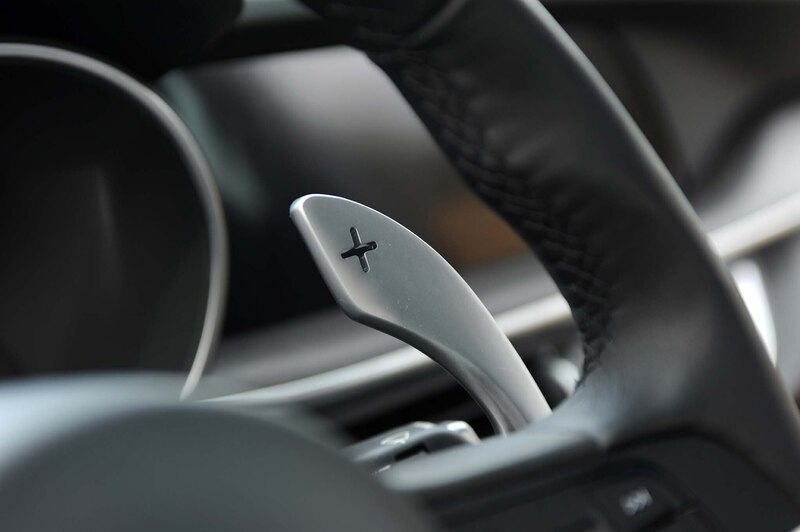 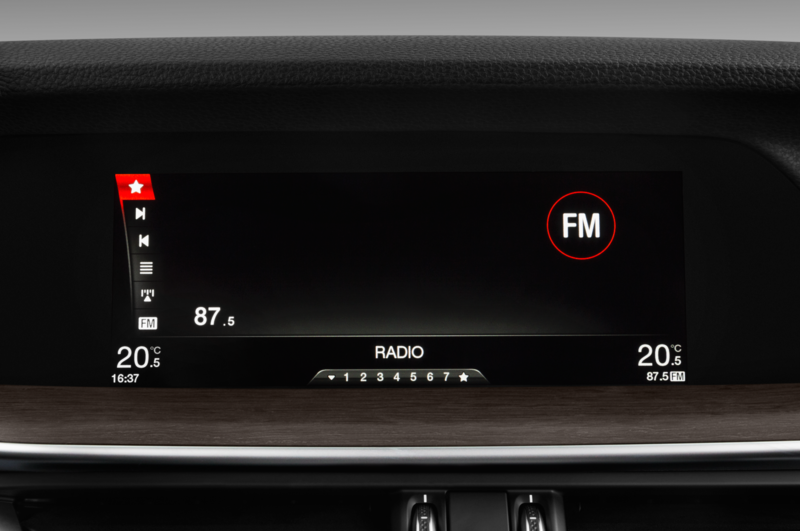 The leather is high-quality, and the controls and displays work well enough, but the overall look is basically monotone, with the aluminum accents adding only a marginal amount of dressing. 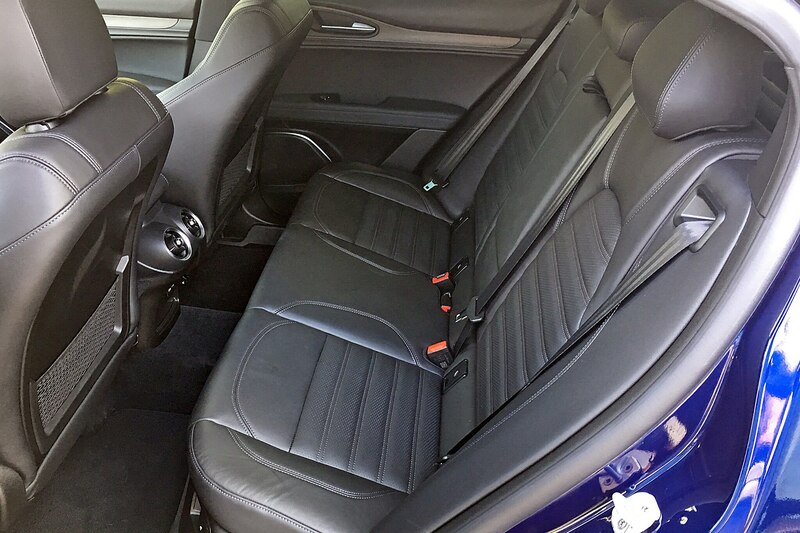 That said, my wife loved the look, commenting as she climbed aboard: “What a cool vehicle.” I know better than to argue, but at least the Genesis G80 Sport I drove recently had some glossy carbon-fiber trim to spice-up the dash and doors. 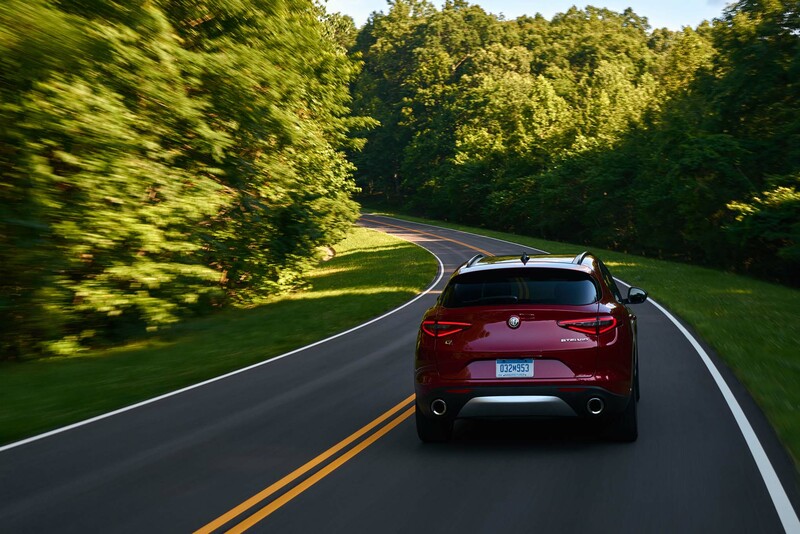 Compared with rivals like the Audi Q5, the Stelvio TI Sport is a finer-edged, more playful machine. 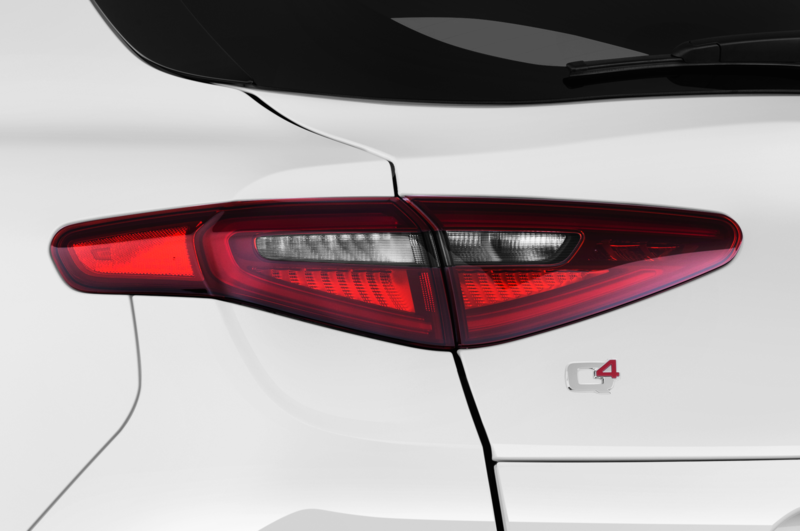 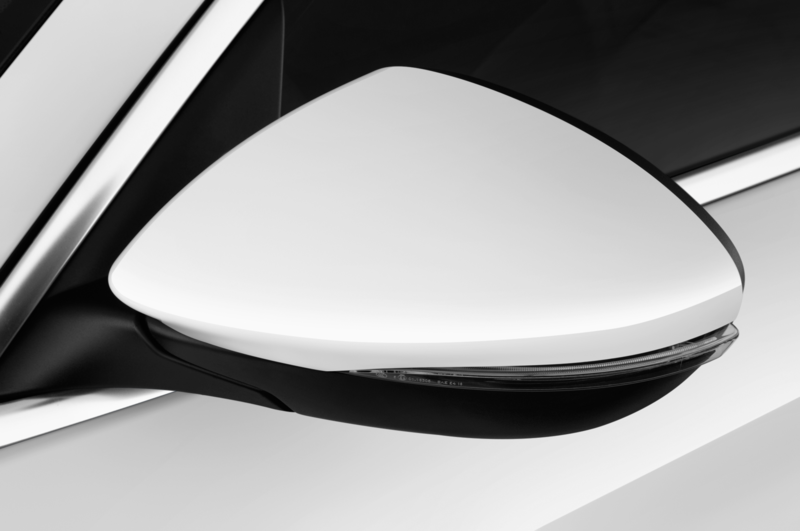 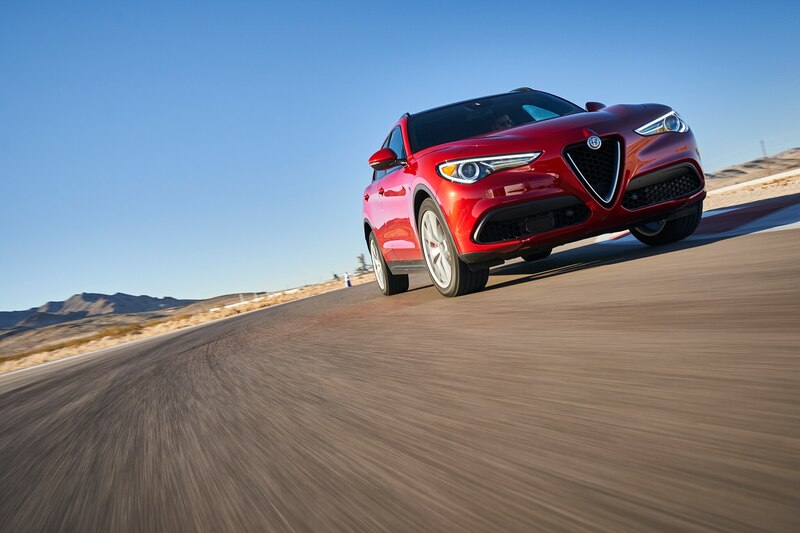 Its aluminum architecture helps it undercut its rivals on the scales, and you can feel it. 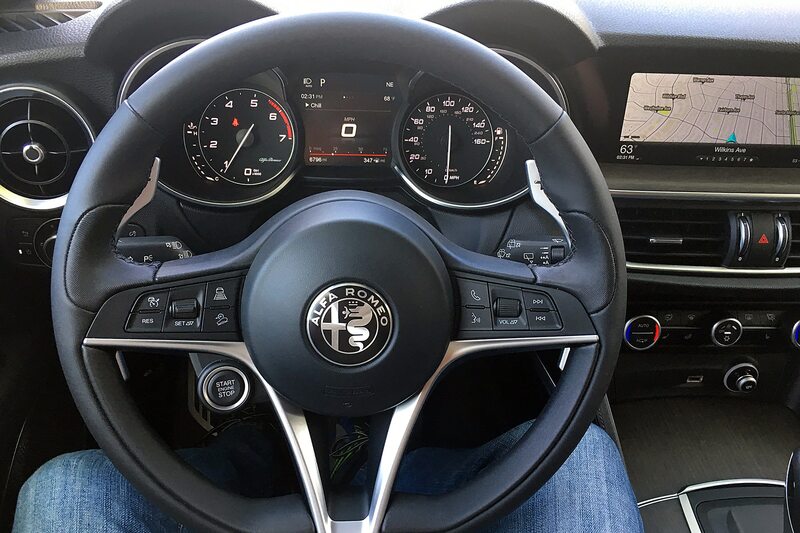 Its steering may lack the fabulous, ultra-quick response of the Giulia Quadrifoglio sedan’s, but switch into Dynamic mode (pretty much how I drove the Stelvio all the time) and the feel sharpens appreciably. 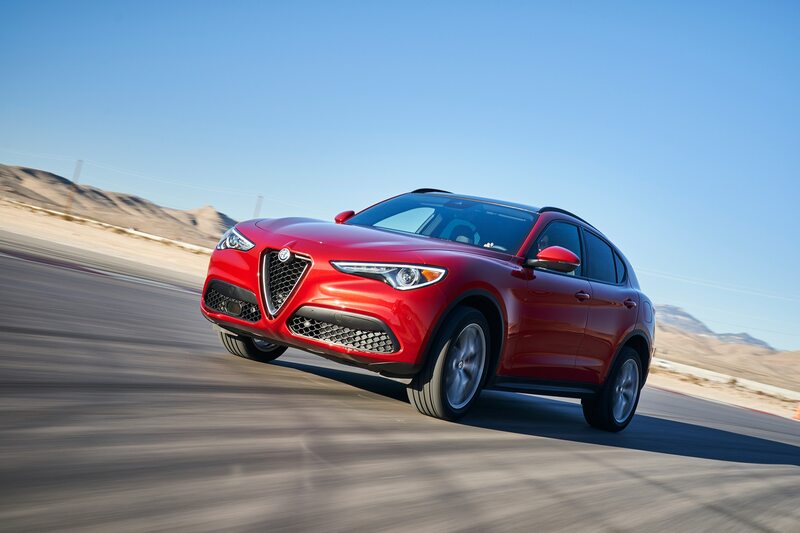 The suspension is grippy, responsive, and pleasing to push hard—despite the vehicle wearing 255/45R20 all-season rubber. 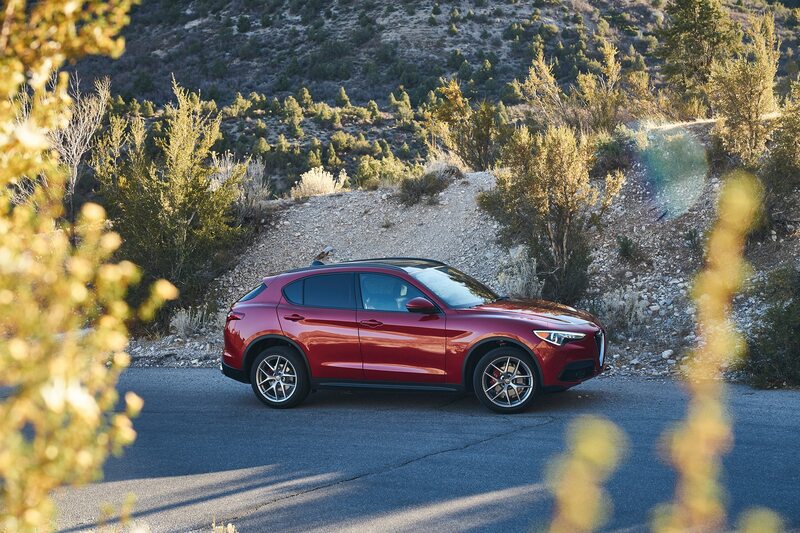 Certainly made me wonder how good the top-level Stelvio Quadrifoglio must be. 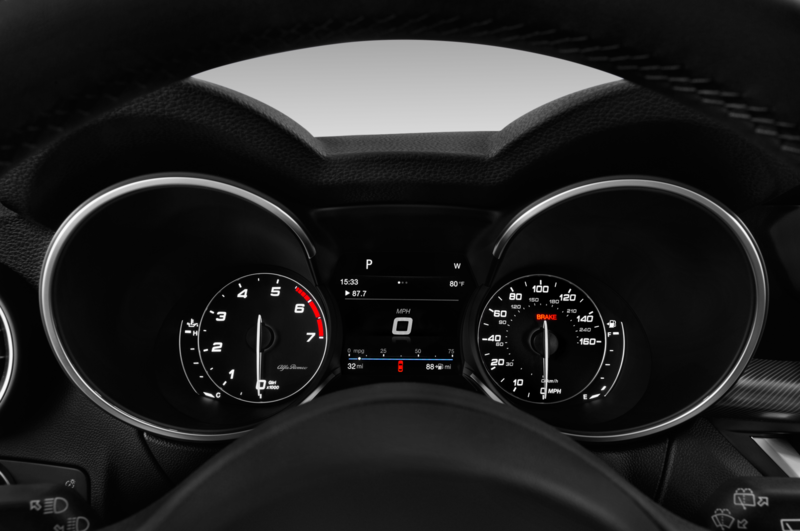 As noted earlier, the little turbo four is a happy piece, serving-up max torque at just 2,000 rpm and spinning easily to redline. 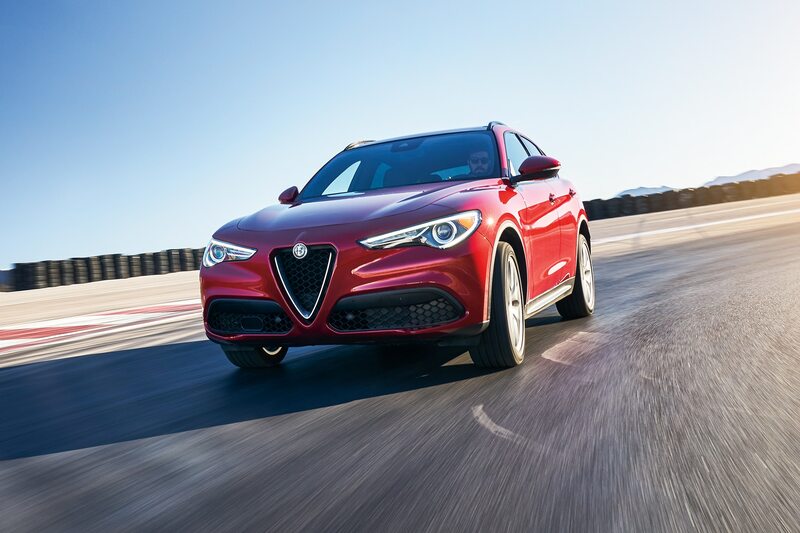 The standard 8-speed automatic is also surprisingly good. 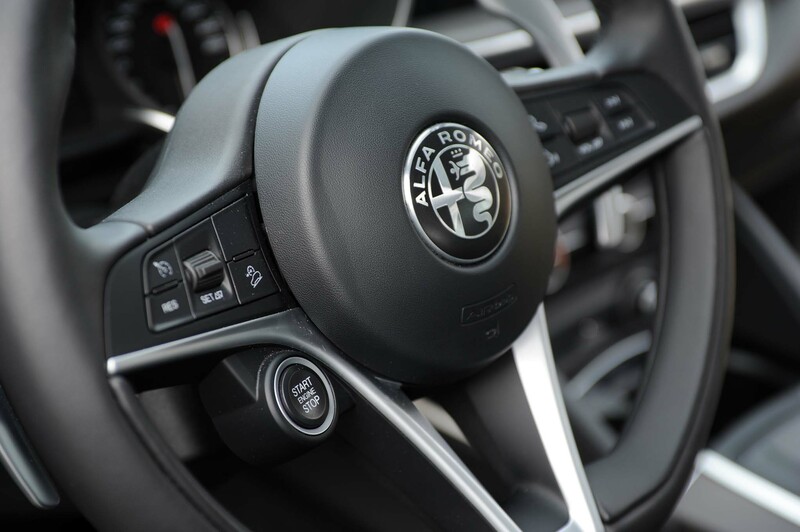 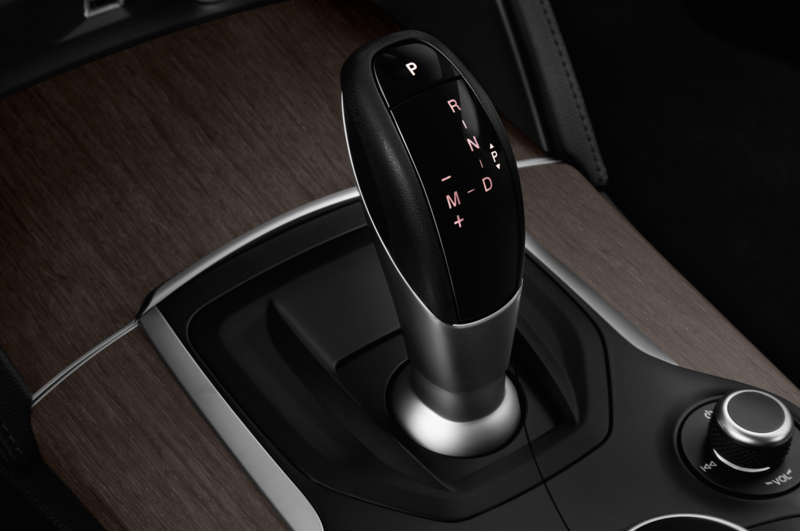 Okay, it’s not as light-switch quick as a dual-clutch unit, but the paddle shifters and well-spaced cogs make keeping the engine on the boil a no-brainer. 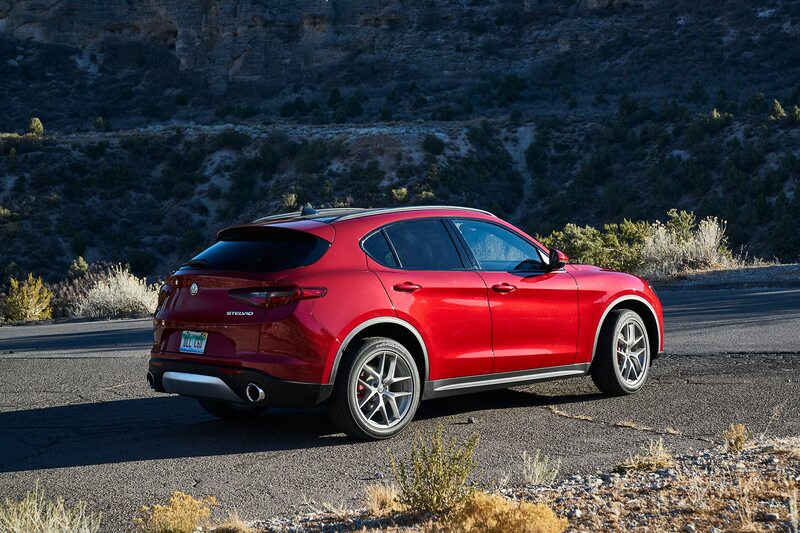 Find a long enough stretch of empty road (preferably in Germany, where it’s legal) and this sleek little SUV will keep right on gunning until it hits an impenetrable wall of air at 144 mph. 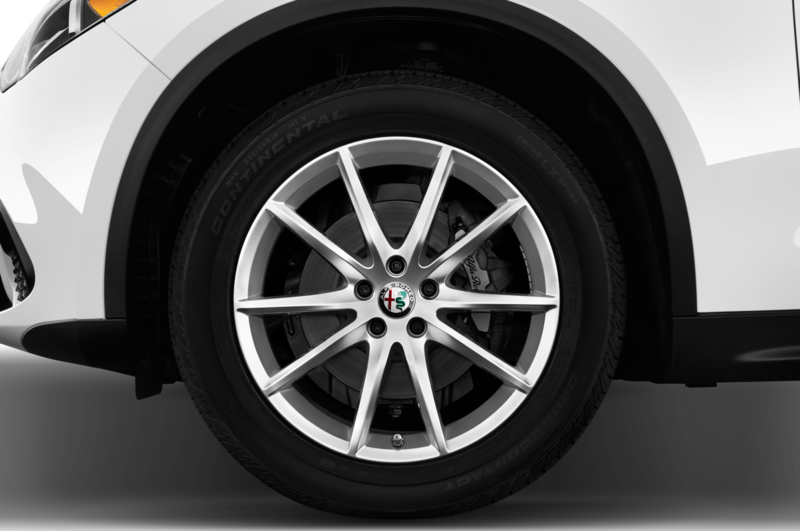 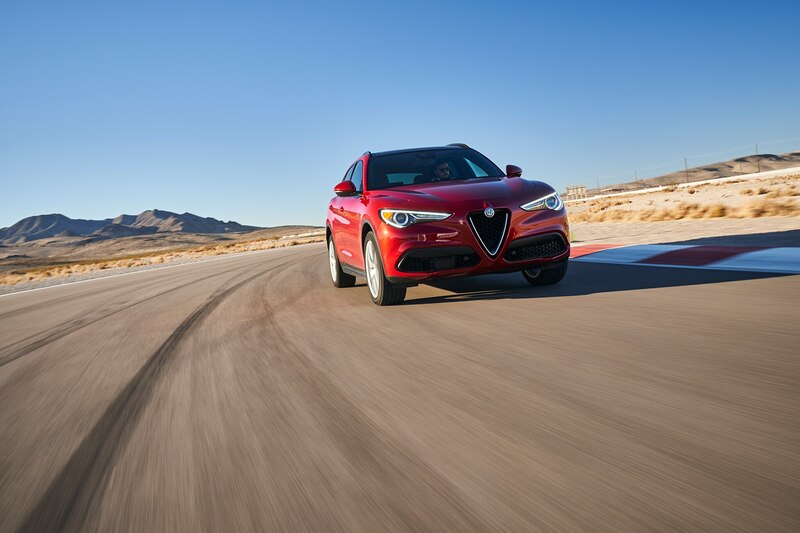 The Stelvio delivers in the other direction, too: Brembo brakes are standard all-around, and the on-board brake-by-wire system works just right—smooth and progressive, unlike the grabby binders in the Giulia Quadrifoglio. 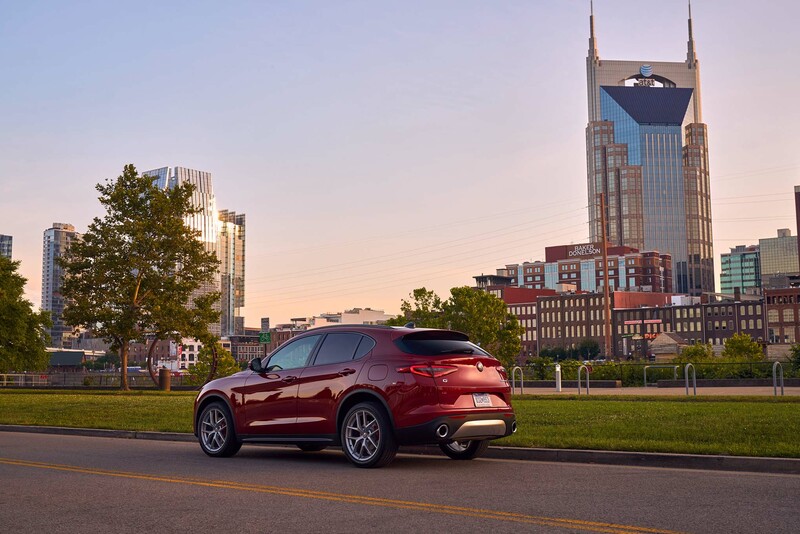 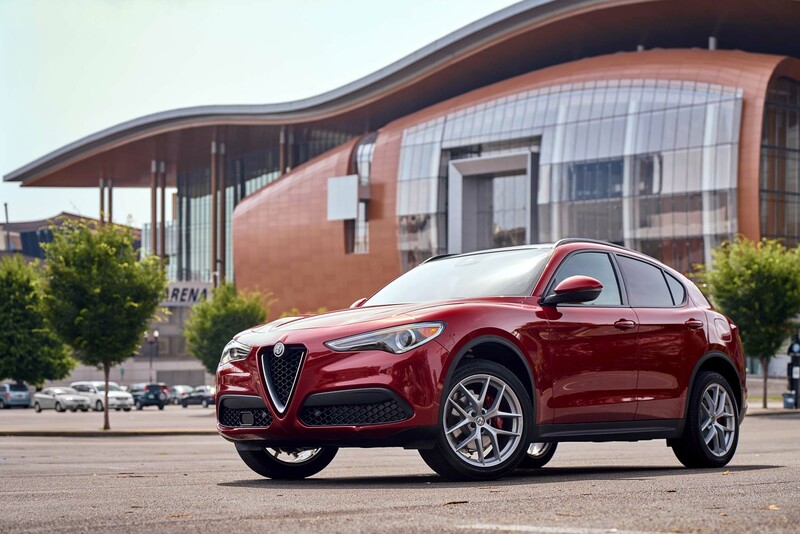 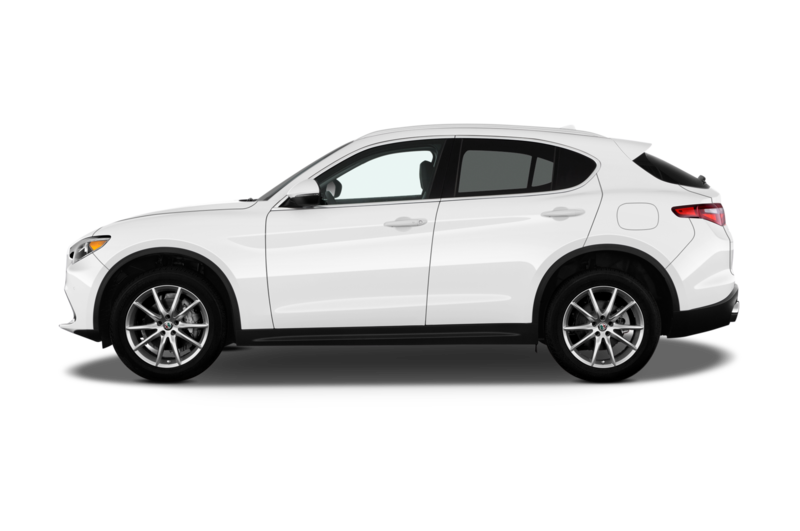 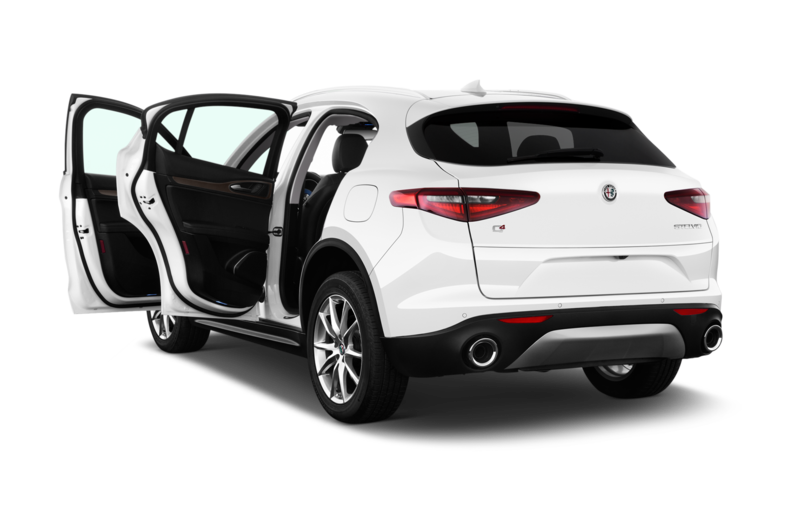 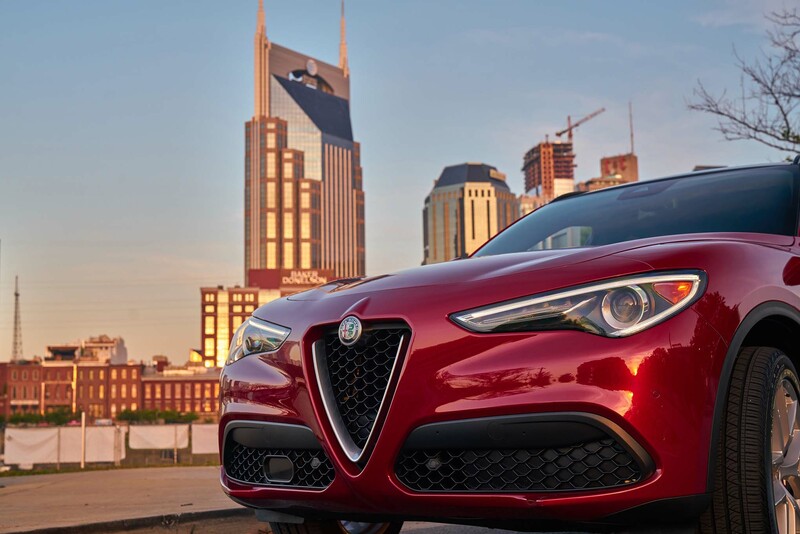 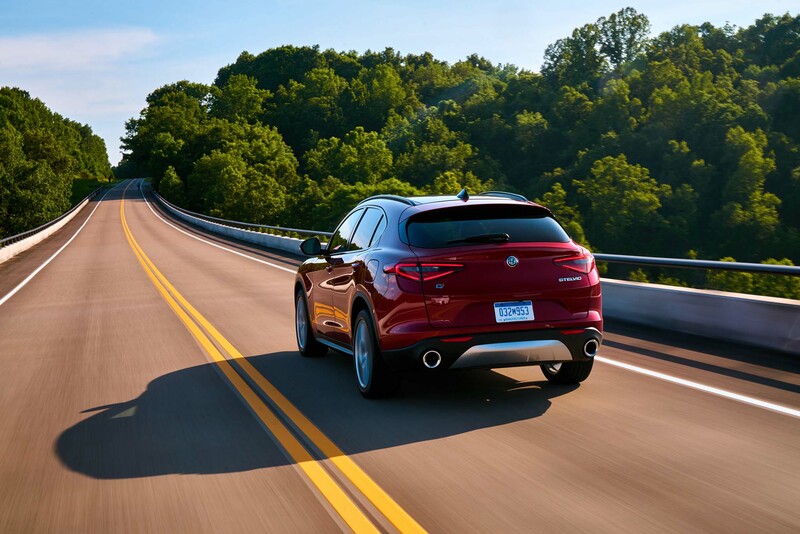 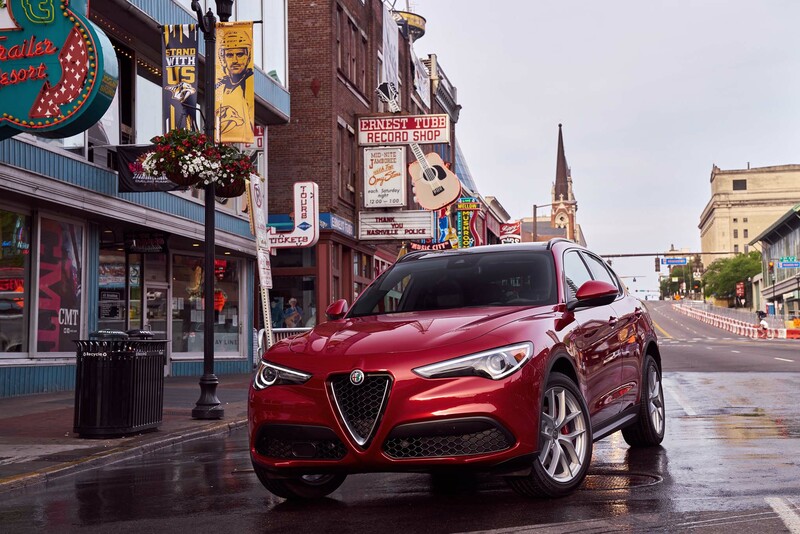 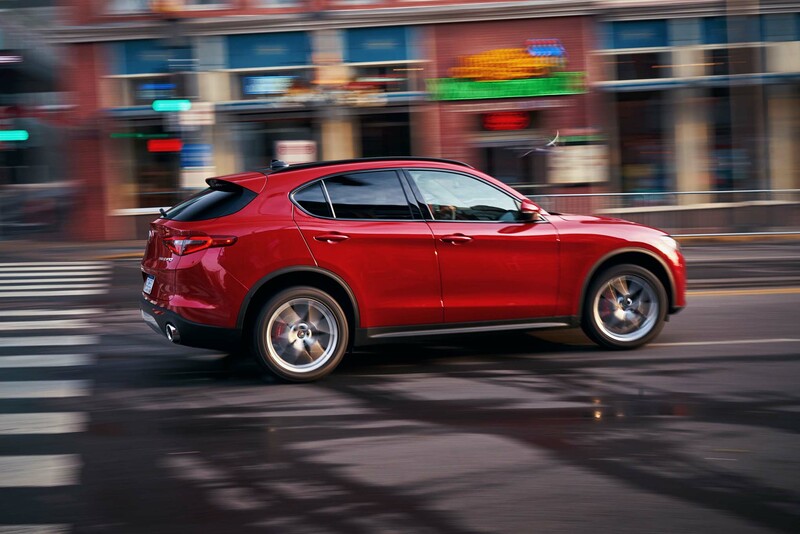 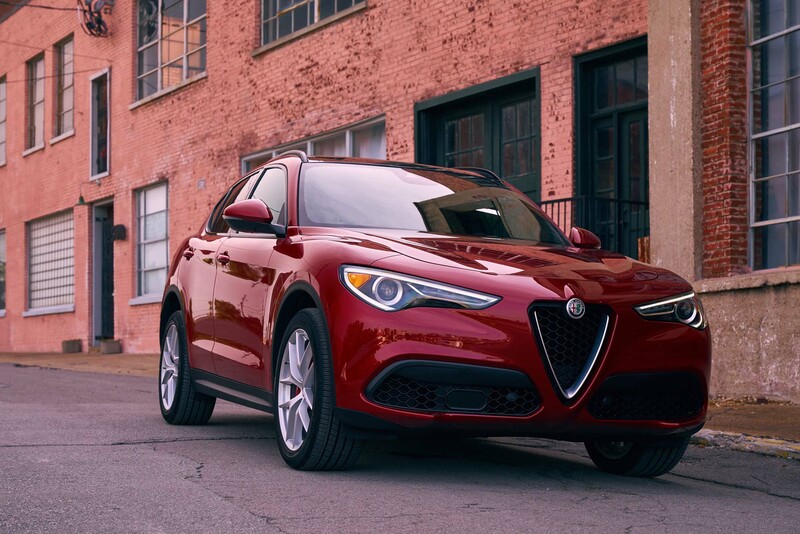 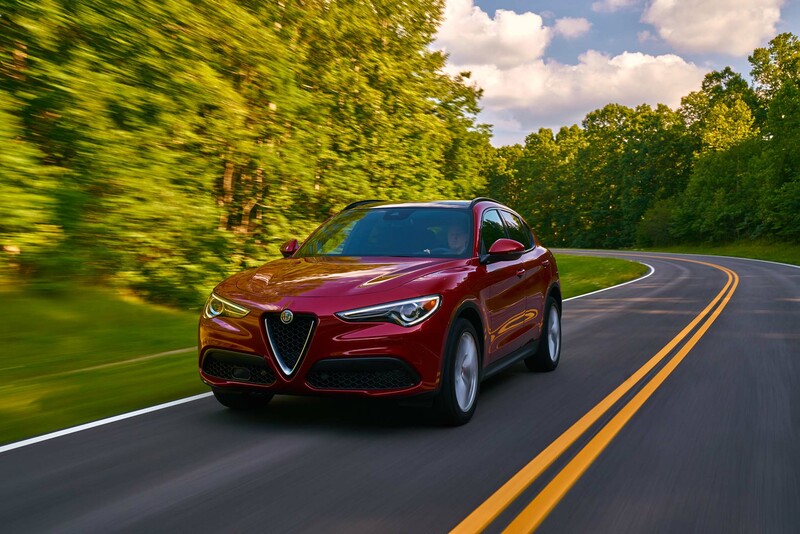 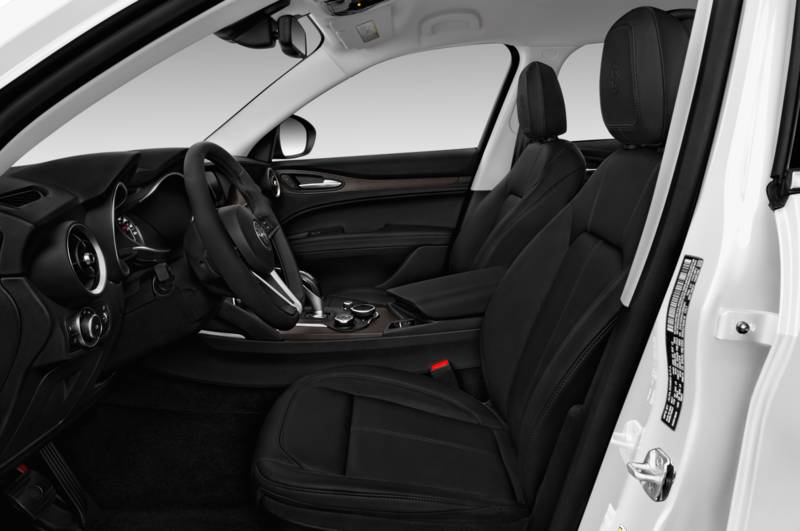 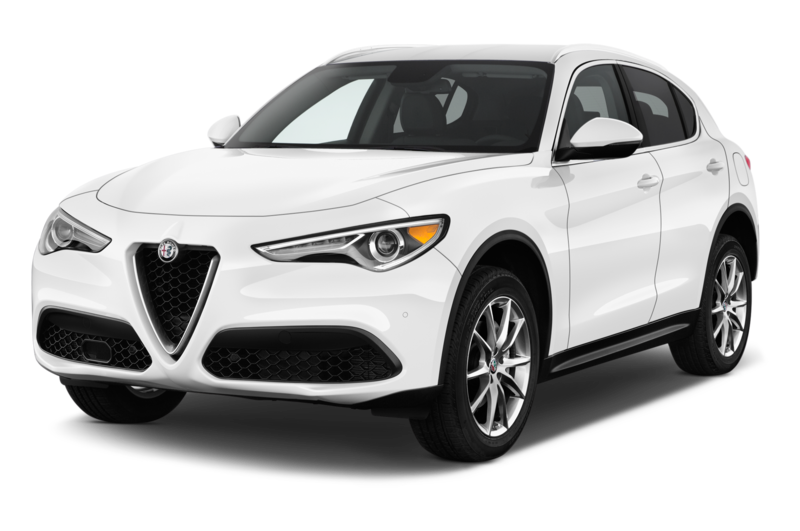 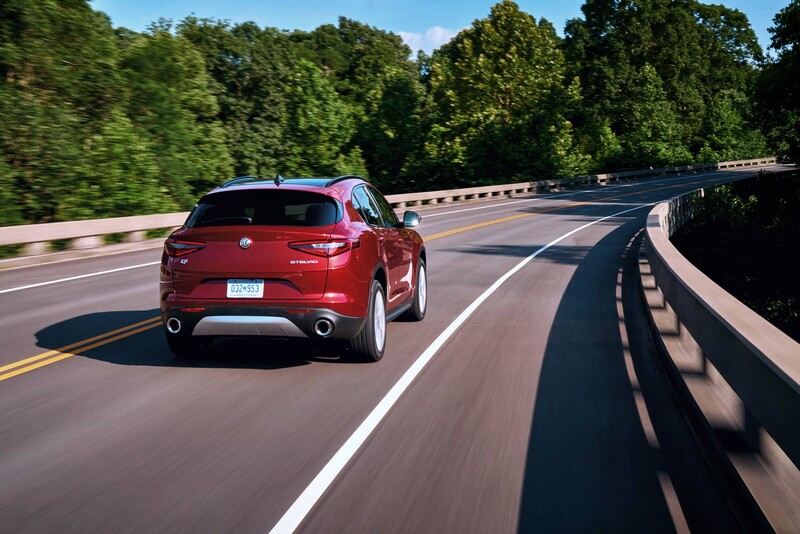 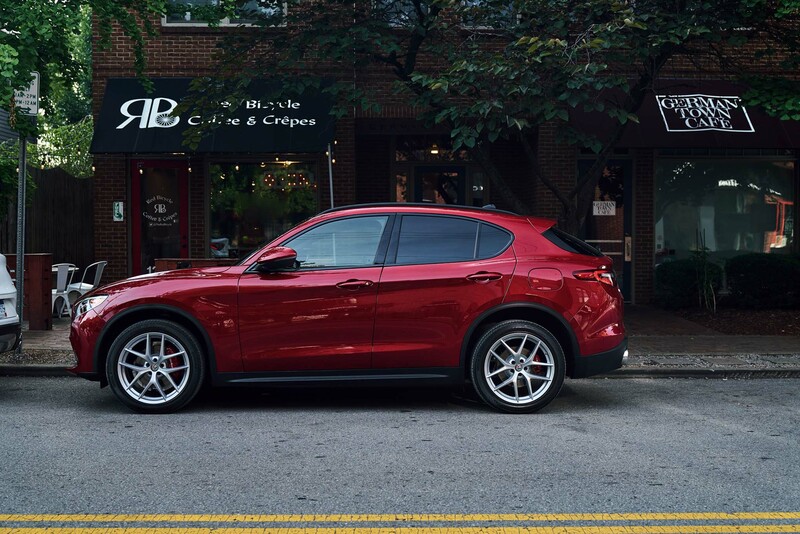 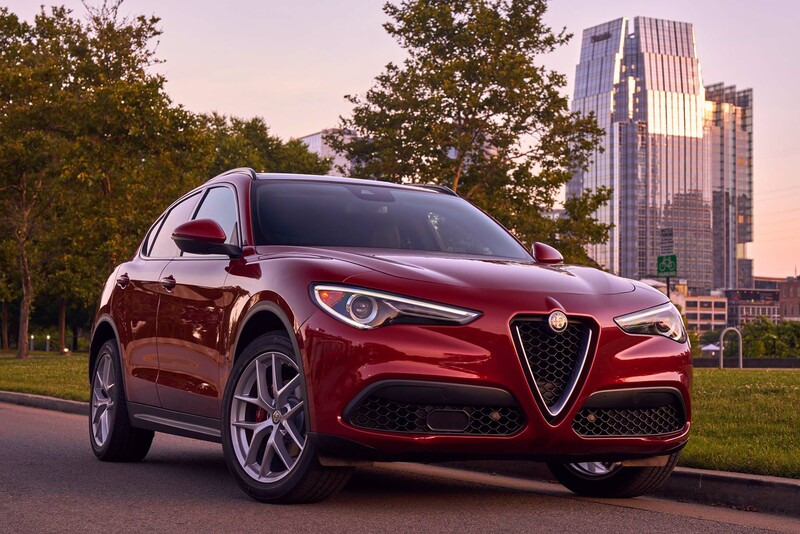 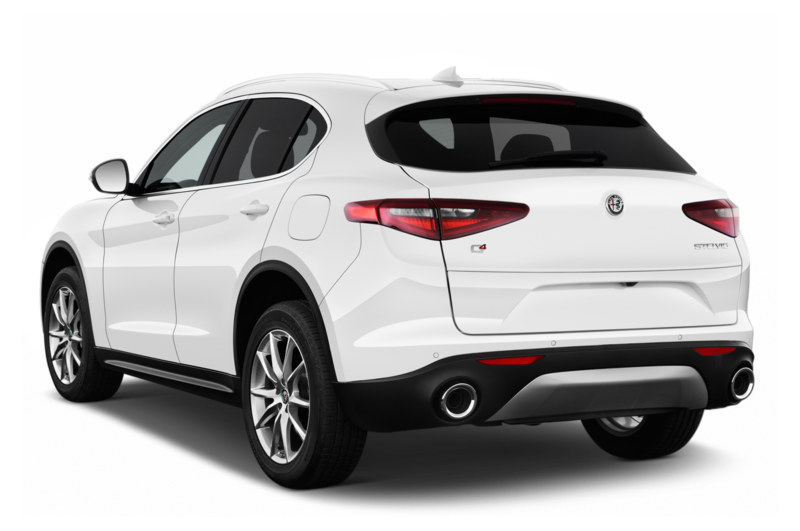 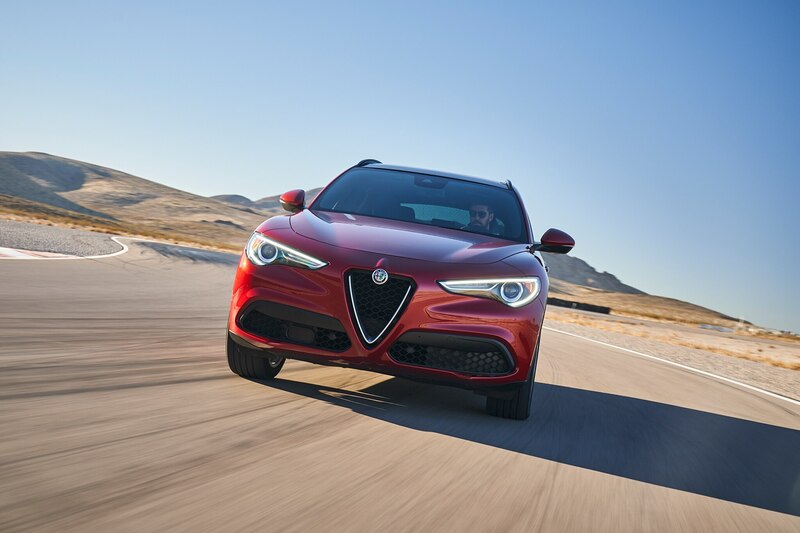 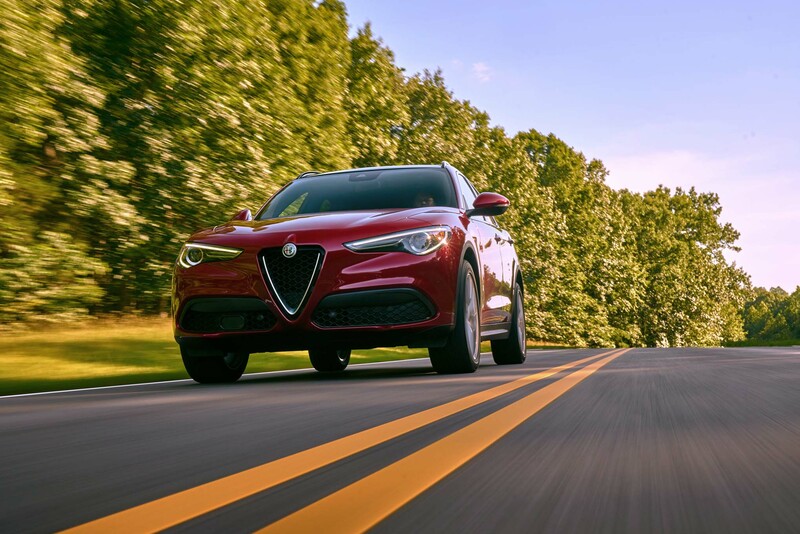 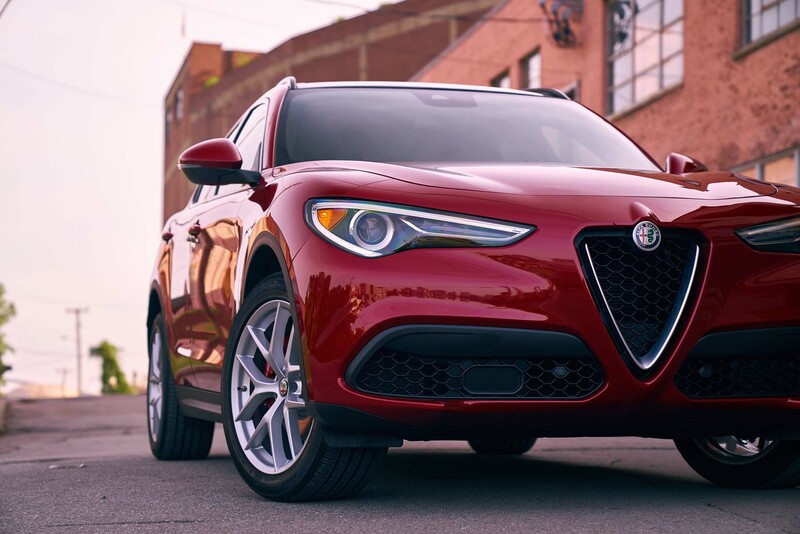 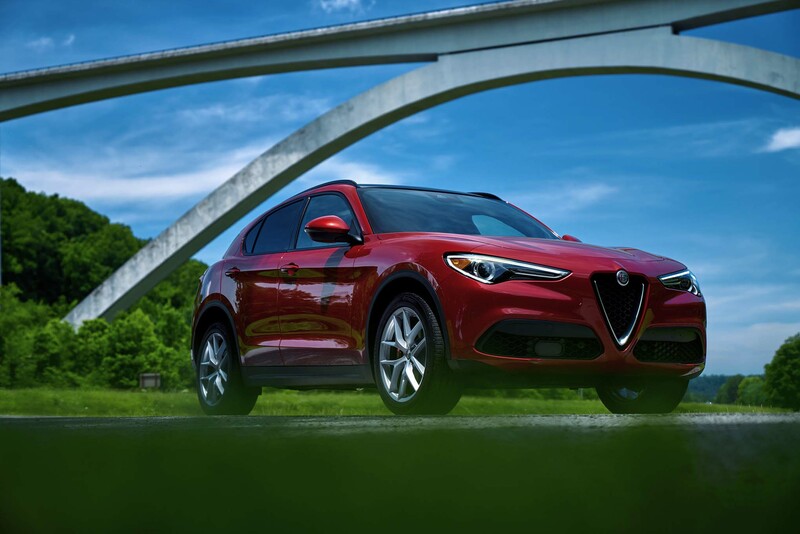 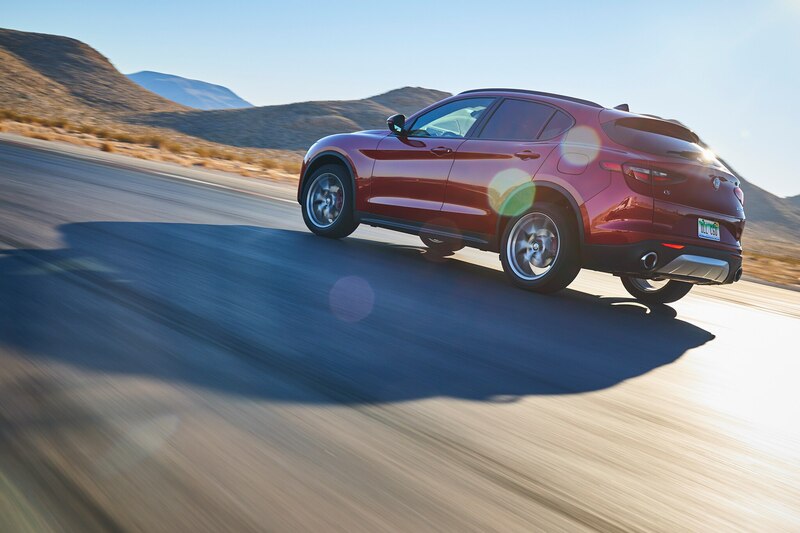 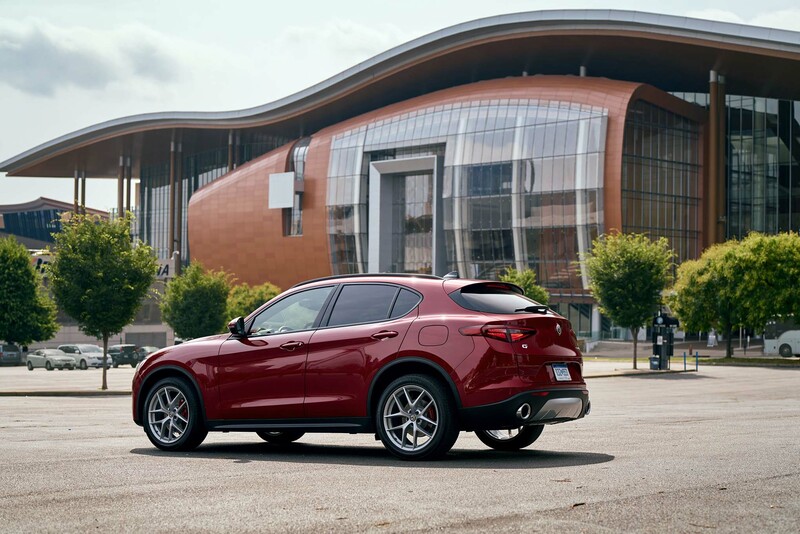 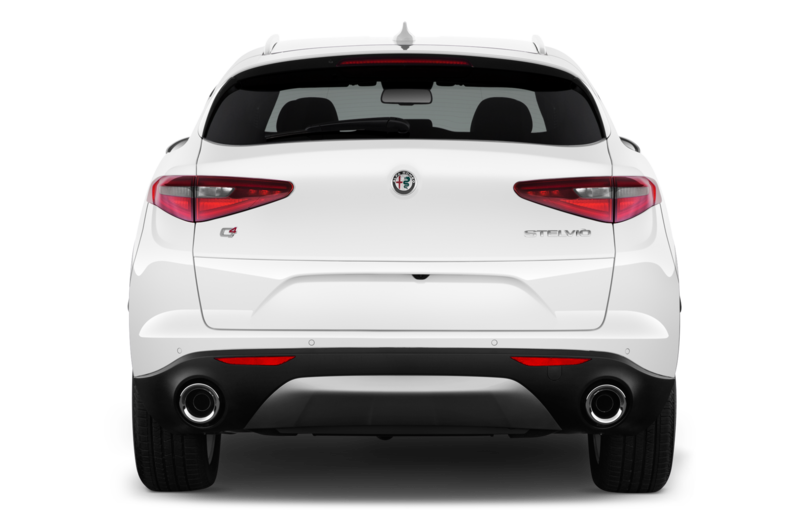 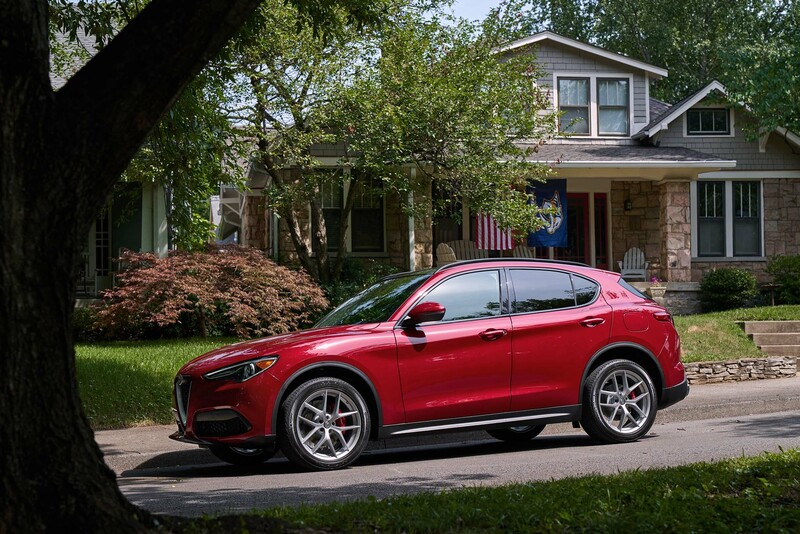 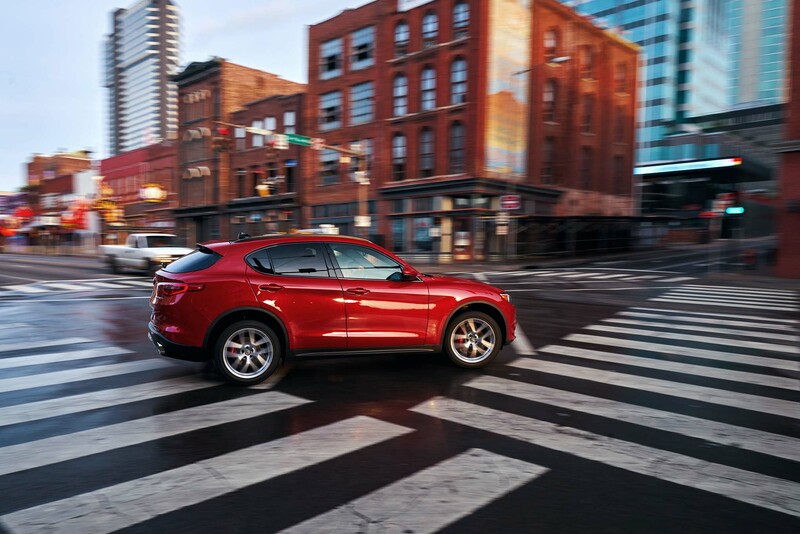 At $54,090 for my loaded tester, the 2019 Alfa Romeo Stelvio Ti Sport returns a compelling dollop of style, performance, and amenities. 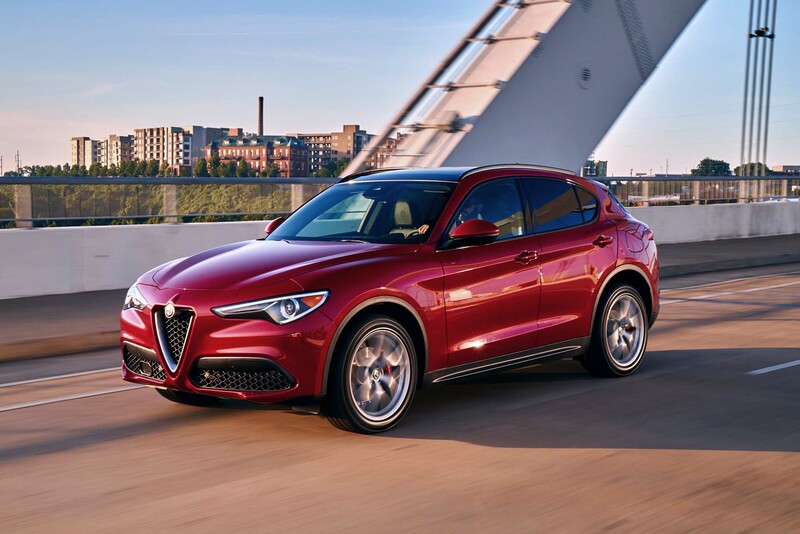 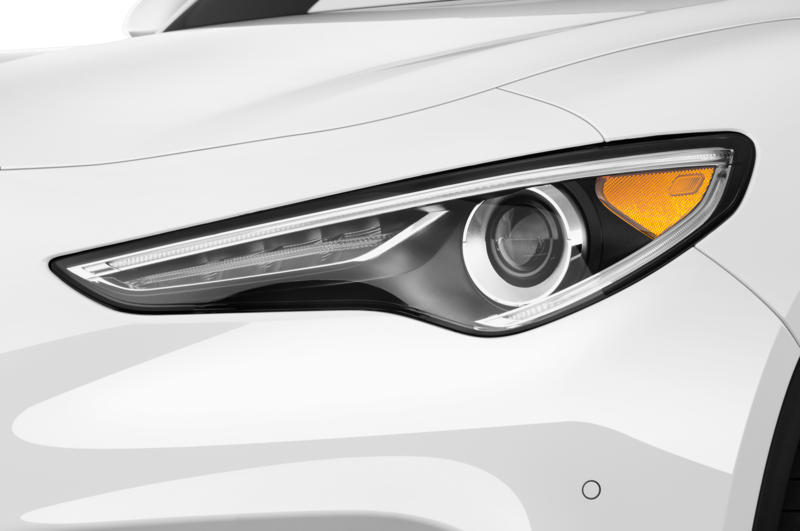 It’s brimming with distinctive flavor, from the dramatic, V-shaped grille up front to the flair of its gleaming sport exhausts. 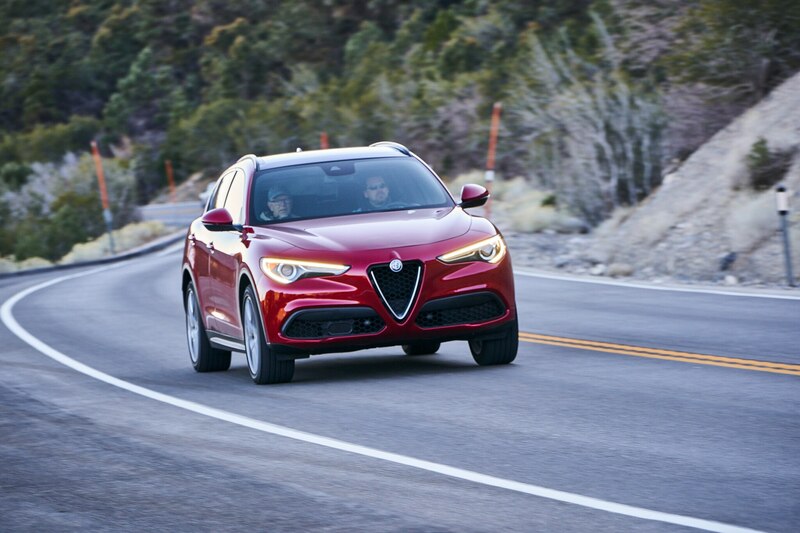 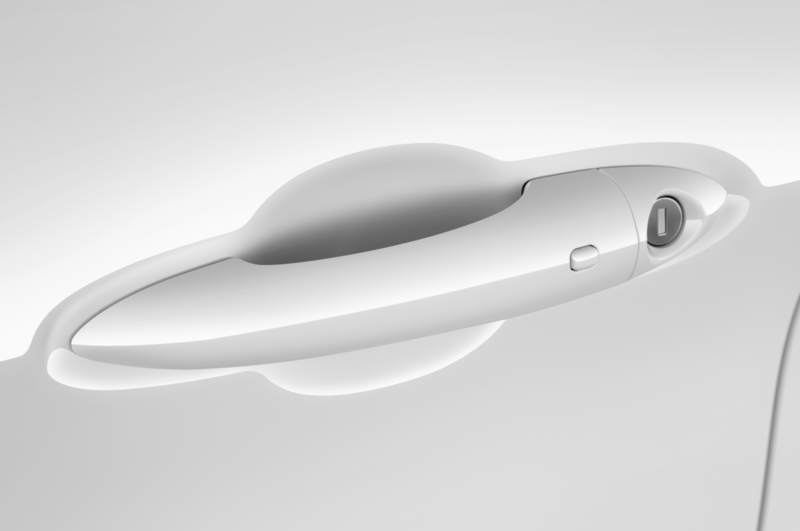 Its over-the-road finesse and spirit edge it toward the front of the class, too. 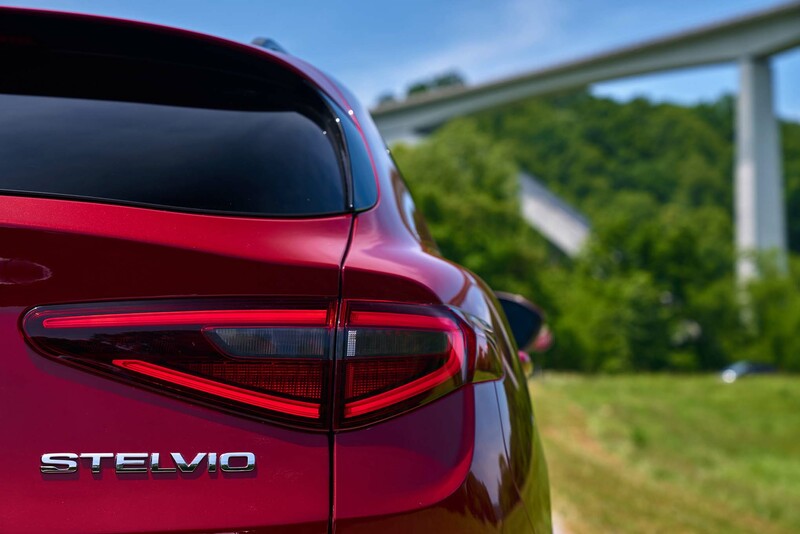 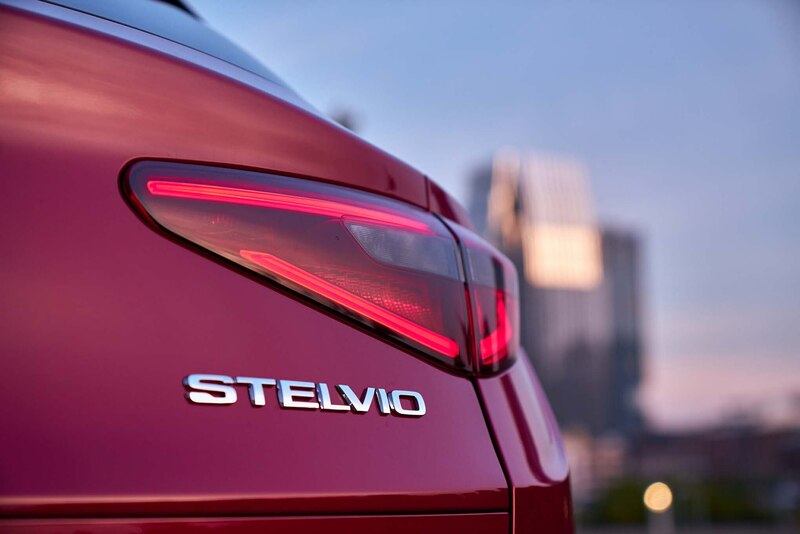 “Driving fun” isn’t something one normally equates with a crossover, but the Stelvio serves up plenty of it. 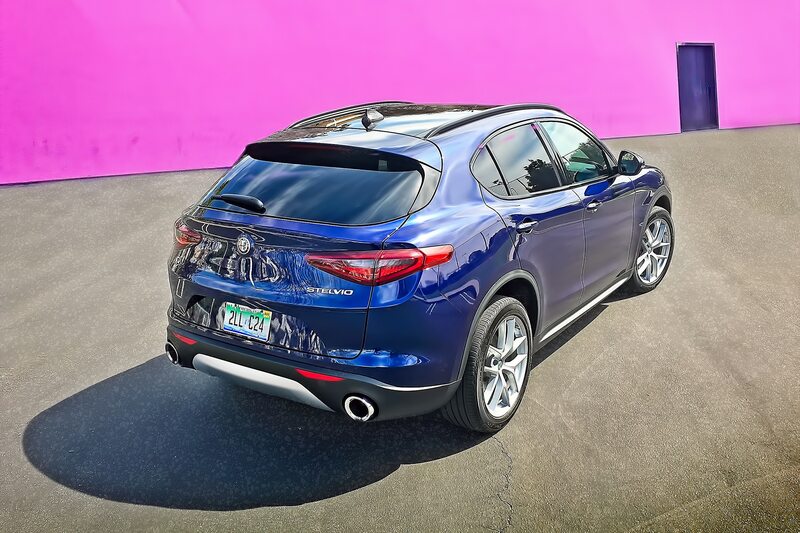 Add that svelte bodywork and…well, you could easily pretend you’re heading to the slopes in Cortina when you’re actually just stuck in traffic in Cerritos. 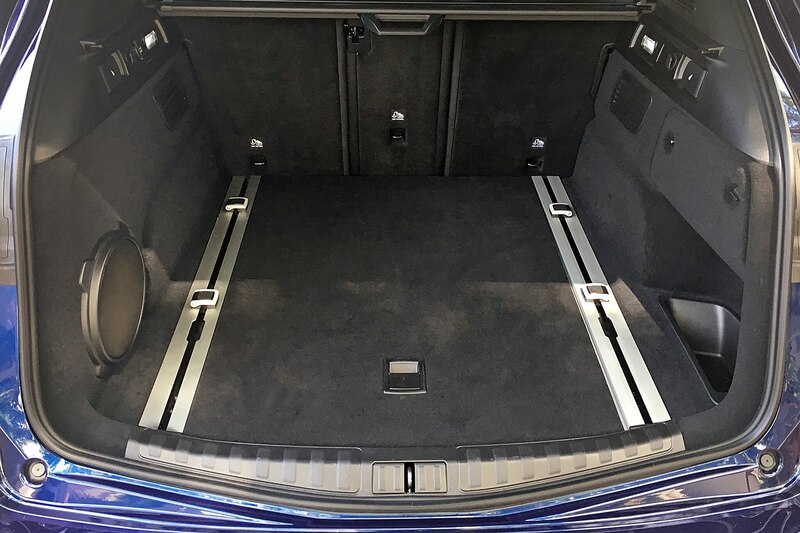 Is a strong chassis enough?